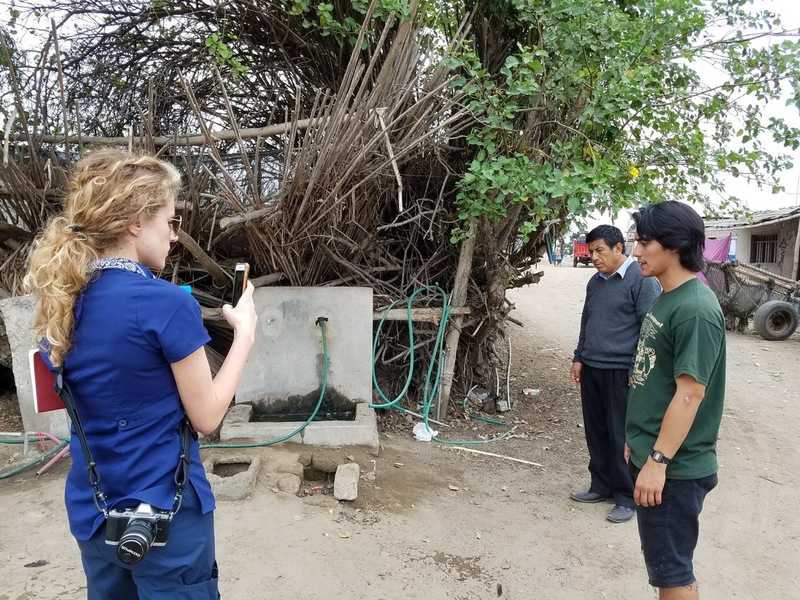 Stephanie Mitchell, a University of Incarnate Word nutrition professor on our immersion trip, is very concerned about water quality and how that can bring health or disease. 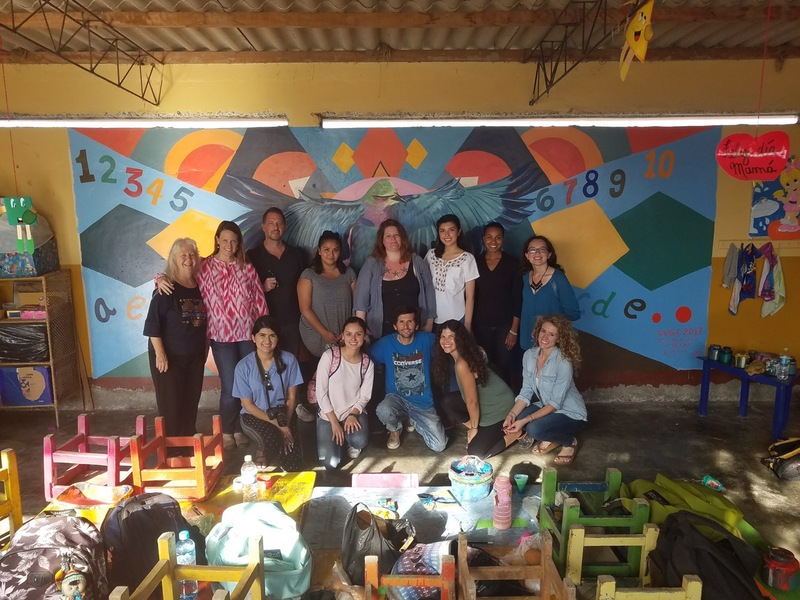 She had a conversation with the director of a school in the rural outskirts of Chimbote, next to a preschool where Incarnate Word Missionary Selena Mitchell works and where Women’s Global Connection volunteers painted a mural with local artist Richard Jon Castaneda Estrada. 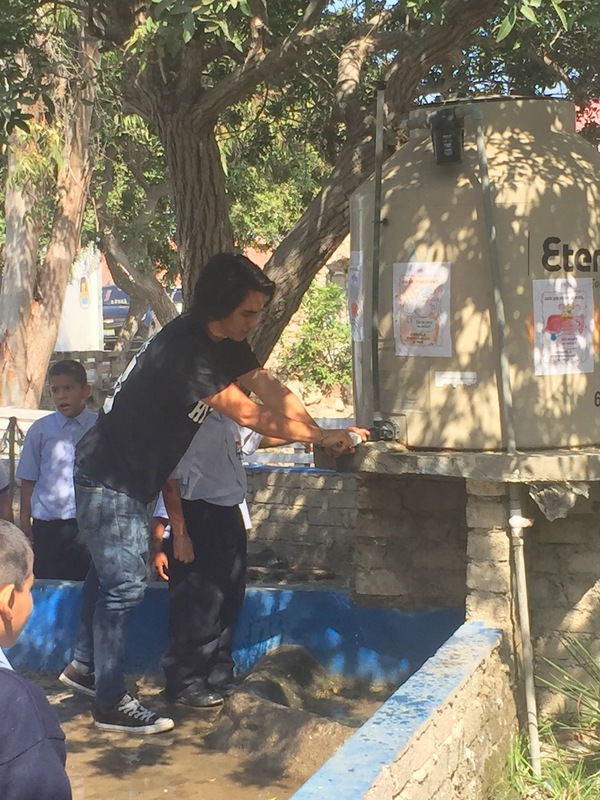 The principal explained that the school has water piped there but the people in the little neighborhood behind it don’t have regular water service. So the water from the school runs to a hose which is in the middle of the houses. There each family can get some of the water. You can see a water container on the top of the house. He further explained that often the weekly water runs out and for two days people will not have water. The people sometimes wash their clothes in the irrigation ditch across the street from the school. The school has outdoor toilets that can be flushed and have a septic tank. This is about 30 ft from the irrigation ditch. 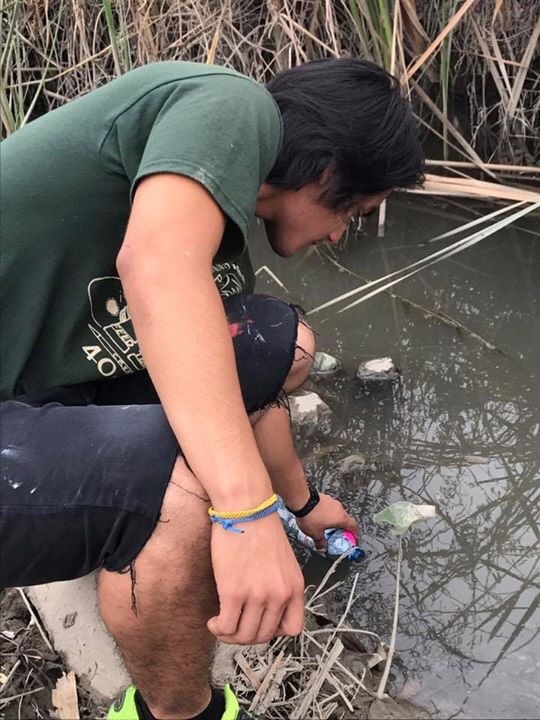 Unfortunately many people throw their trash around and in the irrigation ditch. The people there don’t necessarily boil the water. 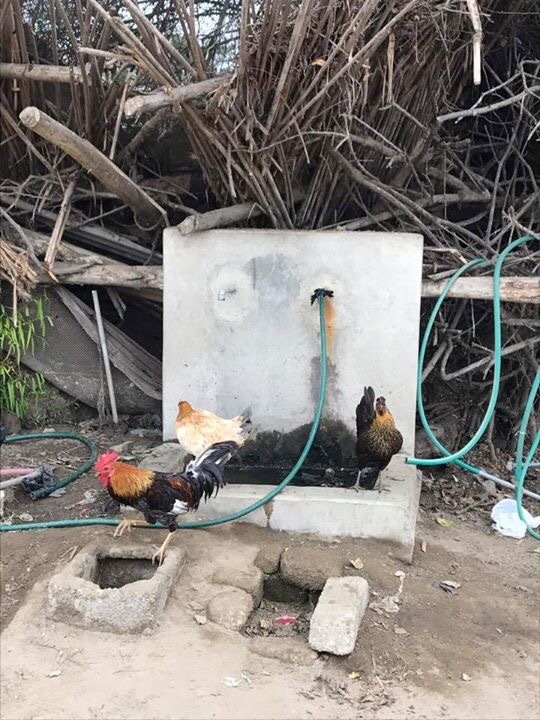 They are just eager to have water. There is a song which has been come become famous in the women’s movement and it is called Bread and Roses. The women who were striking so that they would have better work opportunities said we need both bread and Roses. We need both what is necessary and what is beautiful. The children of the school touch our hearts. The people at the neighborhood that we talked to were kind and happy to have us there. May we be able both to bring them the necessary water that is clean and also beauty in the mural that we painted for the preschool. Stephanie is in contact with a group called 33 buckets. 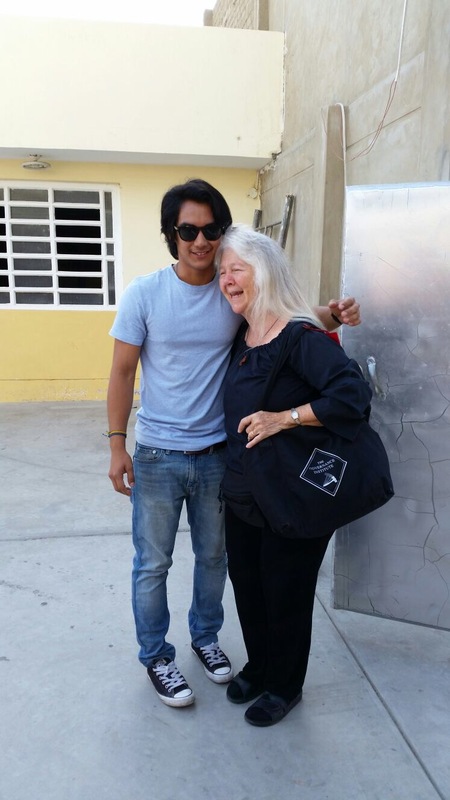 They will be in the Trujillo area in July and she has persuaded them to also come to Chimbote. She is taking samples and testing the water from a number of different places. Then she will send them what she discovers in these water test. They will do more extensive testing and see if this area qualifies for their program. The program would bring water filters to families. One of her plans is to investigate grants to fund these water filters. 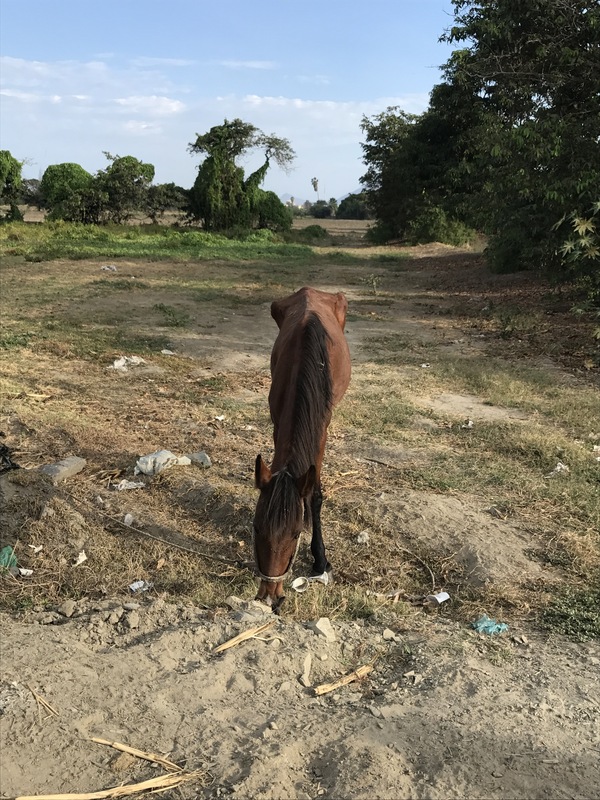 If people could only see the extensive poverty of the families living here and how precious their children are, they would want to be partners helping to get clean water to this extremely needy area. 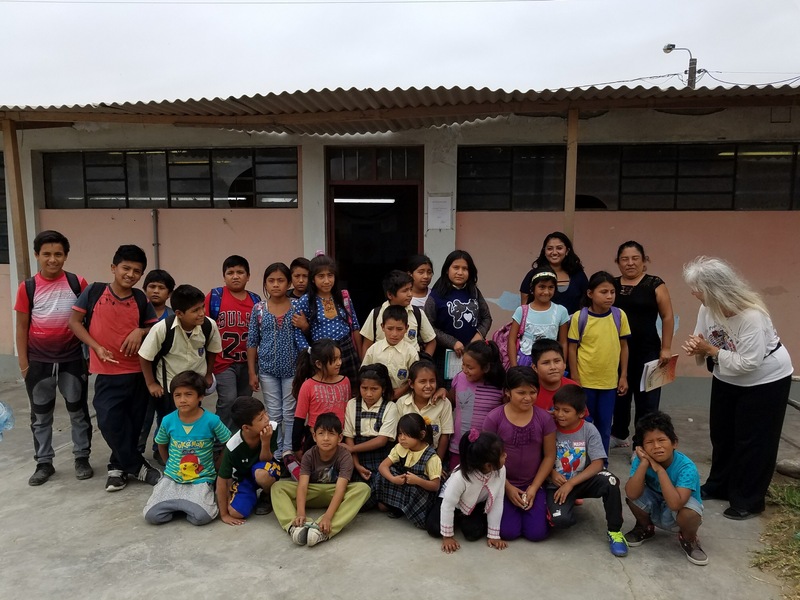 Our group of volunteers with Chimbote artist Richard Jon Castaneda Estrada (far right) who partnered with us on a cultural exchange mural project at a rural preschool here this week. 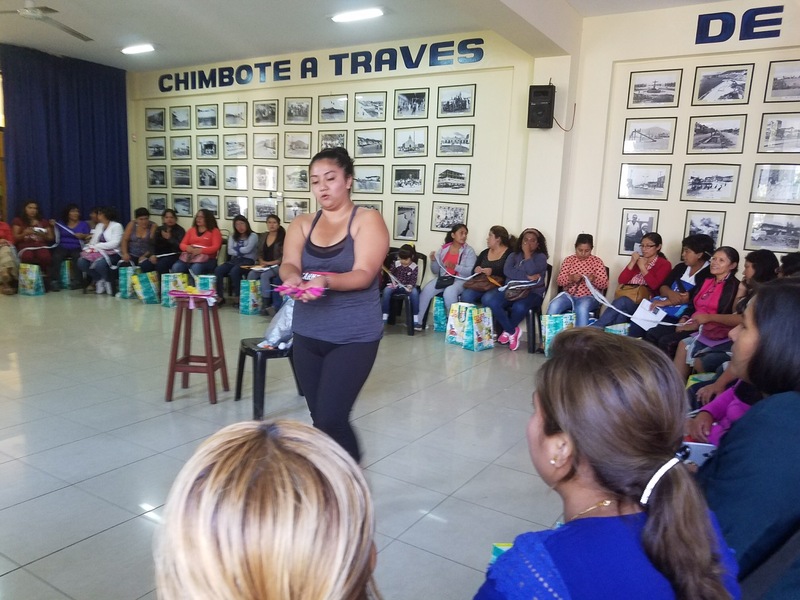 Now more accustomed to the city of Chimbote, on Thursday May 25th, WGC volunteers split up into three groups to attend to several service projects across the city. 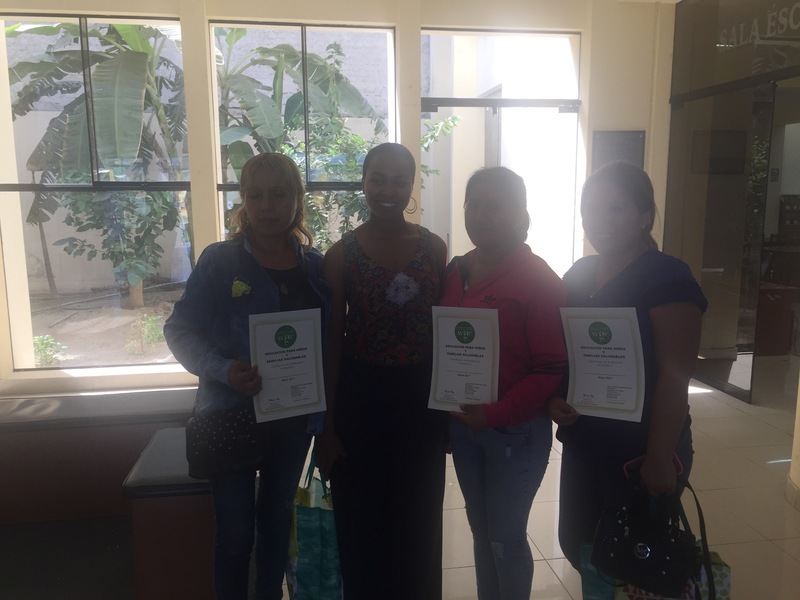 These included providing a workshop for pre-school teachers regarding several methods in improving the health and educational opportunities for the children of Chimbote, painting a mural at a school on those outskirts of town, and visiting the hospice clinic to evaluate the patients and educate them in regards to their nutritional needs. 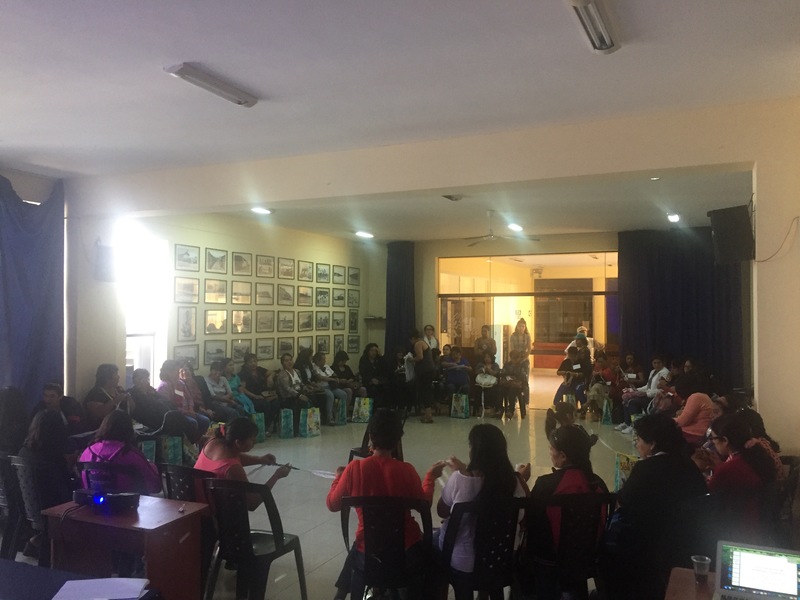 The WGC workshops for over 50 preschool teachers and directors was held in the Centenario Cultural Center built in 2006 for the 100 anniversary of the city of Chimbote. 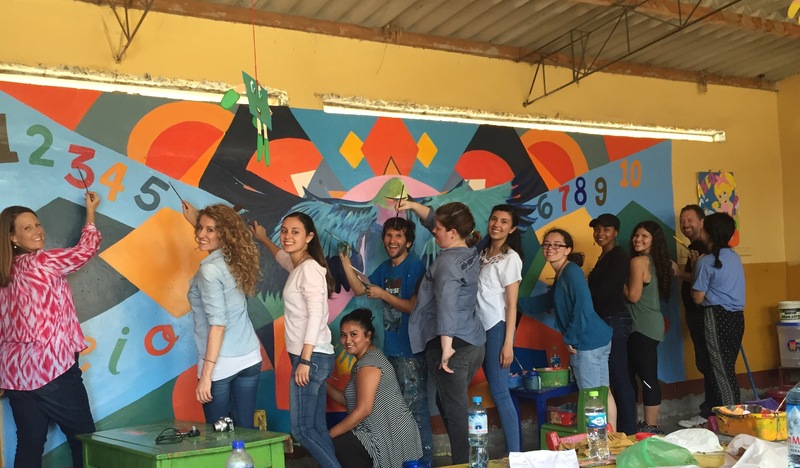 It was lovely setting for the workshops, with Peruvian mural art brightening outdoor walls and melodies from music classes filling the air. 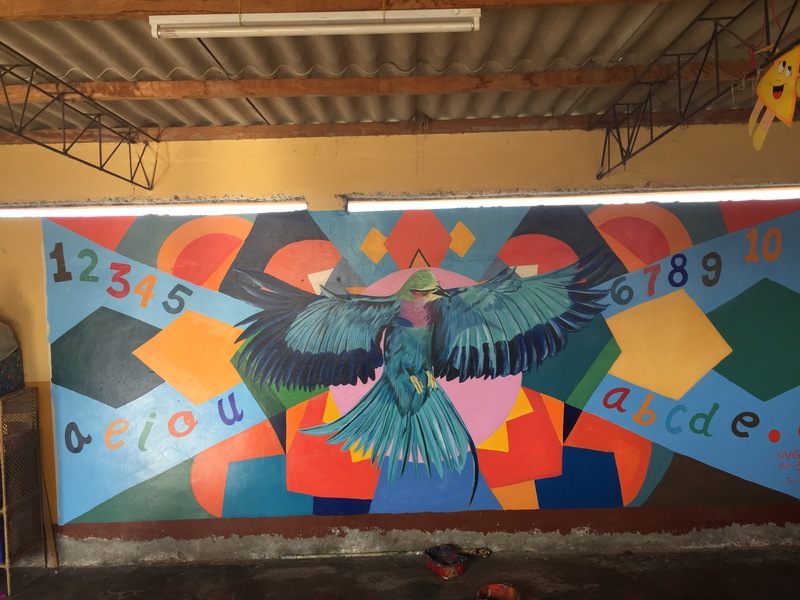 The mural in the first picture above was painted by Richard and displays a wave, a hand for victory and freedom, and faces of significant people who have made the city of Chimbote better. 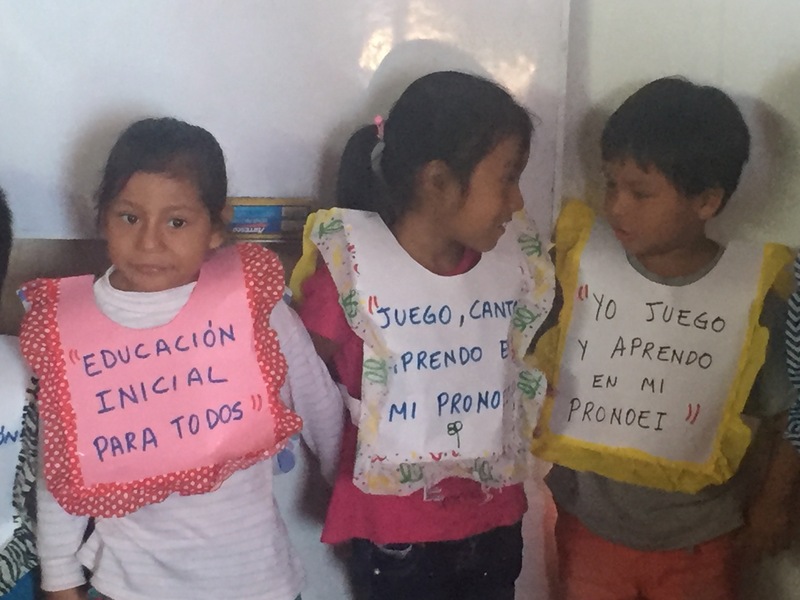 Early childhood teachers in Peru have not had many opportunities for education and development, so Women’s Global Connection provides professional training opportunities for them, usually twice a year. 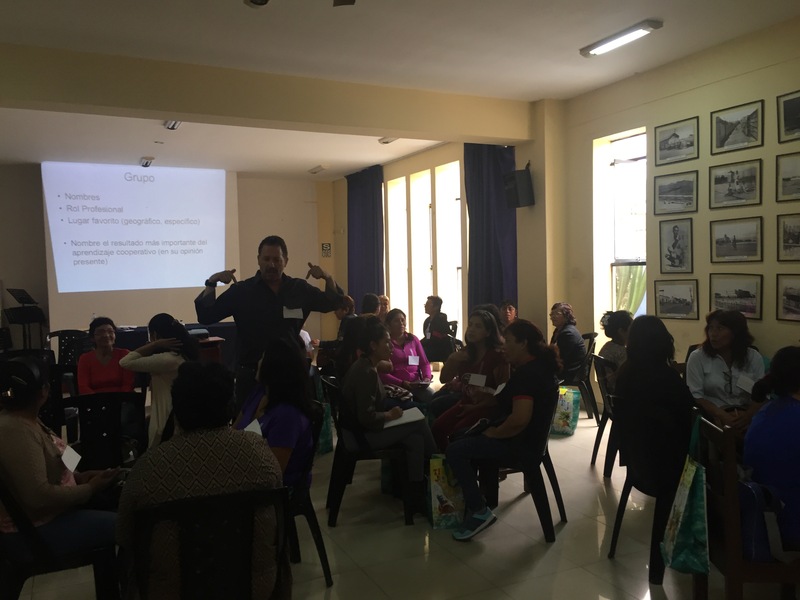 We planned for 15-20 teachers from the Chimbote area but over 50 showed up, so demand is high! After a bit of adjustment for the large number of attendees, we presented talks on sugar intake, infant nutrition, collaborative learning, and reusing waste in creative ways. Our Incarnate Word Missionary Selena did an excellent job in advertising and WGC workshops seem to have a growing reputation that draws in more people each year. Mariel Sanchez, who just graduated from UIW in Nutrition, had made a brochure in Spanish explaining different types of sugar and their advantages and disadvantages. She explained how much sugar is good for children, adolescents, women, and men. Mariel had examples of different types of sugary drinks and a bag of sugar. 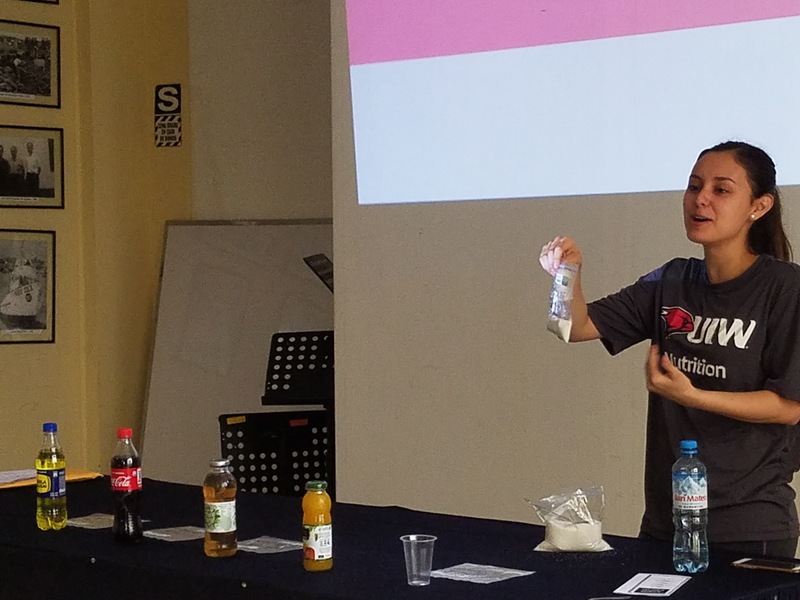 She did a demonstration putting spoons of sugar into plastic bags indicating how much sugar is in each of the drinks. The audience was quite surprised as they saw how much sugar is in orange juice, bottled sweet tea, Coca-Cola, and the local favorite, Inca Kola. Mariel also added the popular Peruvian drink made with purple corn, Chicha Morada. 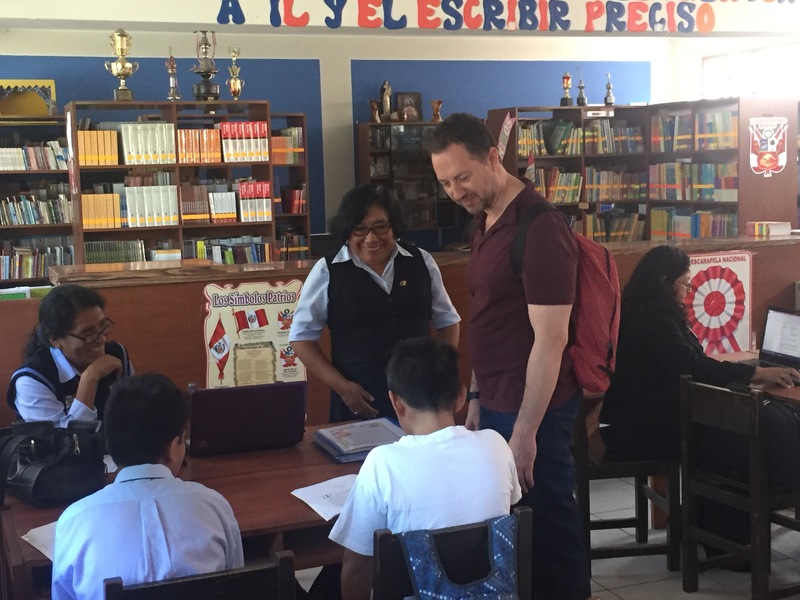 Whether giving workshops on Collaborative Learning for faculty of the University of the Incarnate Word or for Early Childhood teachers in Chimbote, Dr. Brian McBurnett is a master in this area. First, he gets people interacting and enjoying the relationships that they are building. Then he has people try to solve problems individually. It becomes apparent that individual thinking is limited. Brian gives both solid information on the advantages of collaboration in learning and enjoyable opportunities to learn this way. Yasmine Lainez has been involved with care of creation at the University of the Incarnate Word. She is part of the Ettling Center for Civic Leadership and has worked with gardening and other ecological initiatives there. The use of plastics is a critical issue. By 2050 our oceans will have more plastic than fish if we do not make deliberate efforts to stop this tide of waste. Most plastics are used only once and then discarded. Yasmine led a workshop on recycling plastic bags into crocheted purses and other things. As the circle of participants connected their small pieces of plastic, it seemed to be an image of connecting our small efforts around the globe. As Women’s Global Connection joins people, all become stronger and the potential of each of us grows. Elena Valenzuela, UIW Ph.D. Candidate in Organizational Leadership, has a Bachelor of Fine Arts and has been an art teacher. Her project began in earnest Thursday as she and Richard laid down the foundation for was large mural on the outskirts of town. 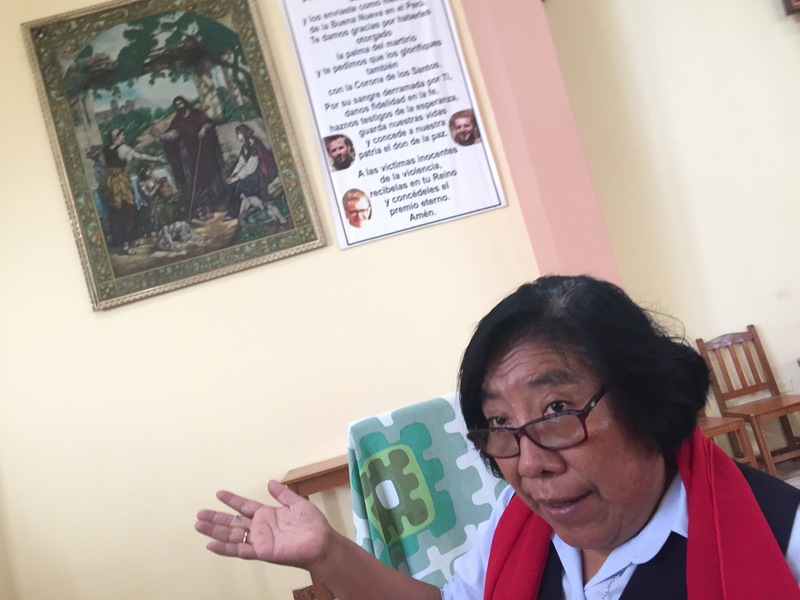 The mural is in one of the preschool classrooms in a school on the edge of Chimbote that Incarnate Word Missionary Selena Mitchell (above) serves in. Completed on Saturday after essentially our whole group pitched in at certain points, it will provide a lot of inspiration to the children in this extremely impoverished area of the city. 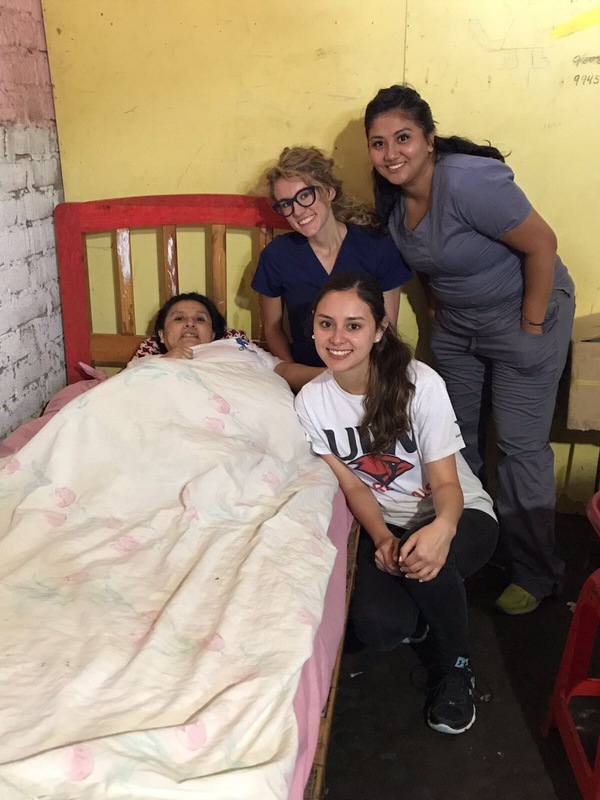 Mariel, Stephanie, and Yasmine have learned about the work of St. James Hospice by working with Incarnate Word Missionary Mark Tribo. In particular, they observed the tube feeding of patients and the particular needs of each of individuals there. 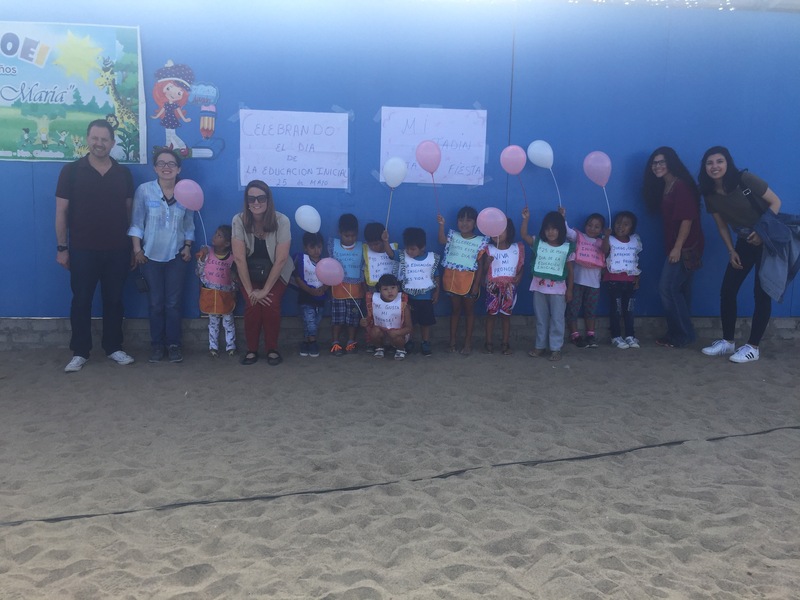 On May 23, we visited both a preschool and secondary school in an outlying area known as Nuevo Chimbote. The preschool was located in an area that is reminiscent of the colonies that dot the border between Texas and Mexico. The small houses surrounding the neighborhood were either made of stucco, thatched grass, metal plates, wood, etc. There is no running water here – a truck goes by each morning delivering water into concrete cisterns. Most homes don’t have electricity and city services are essentially nonexistent. 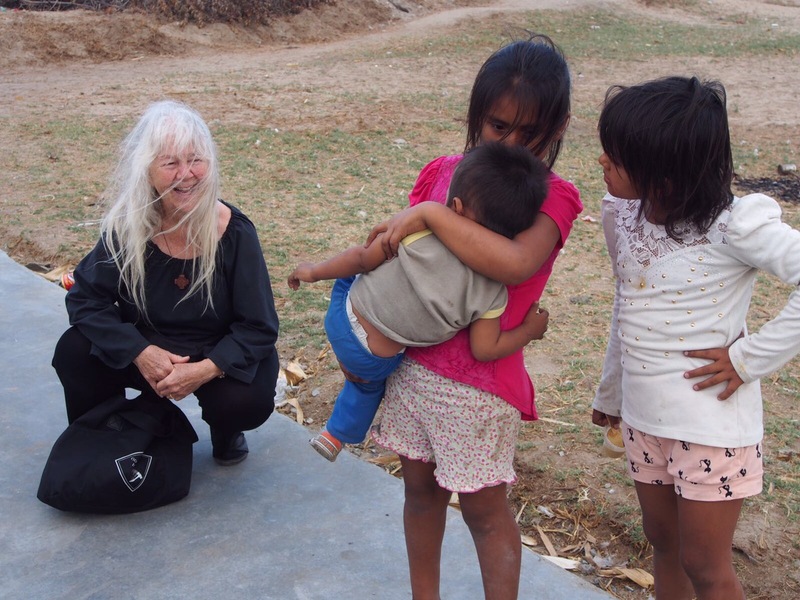 The preschool – taught by a longtime friend of Women’s Global Connection, Edith, was rather small as they had about 12 children. They were all very sweet with a few shy ones as they were hesitant to approach us. They also put on a sweet little show for us, as Edith gave them signs to wear. From there, the little ones held balloons as they paraded around part of their neighborhood as a little fiesta. Though they live in a disadvantaged situation, these children are still able to receive an all-important early education. It was great to see how bright and excited to learn the preschoolers are and how happy they were with us as new visitors. 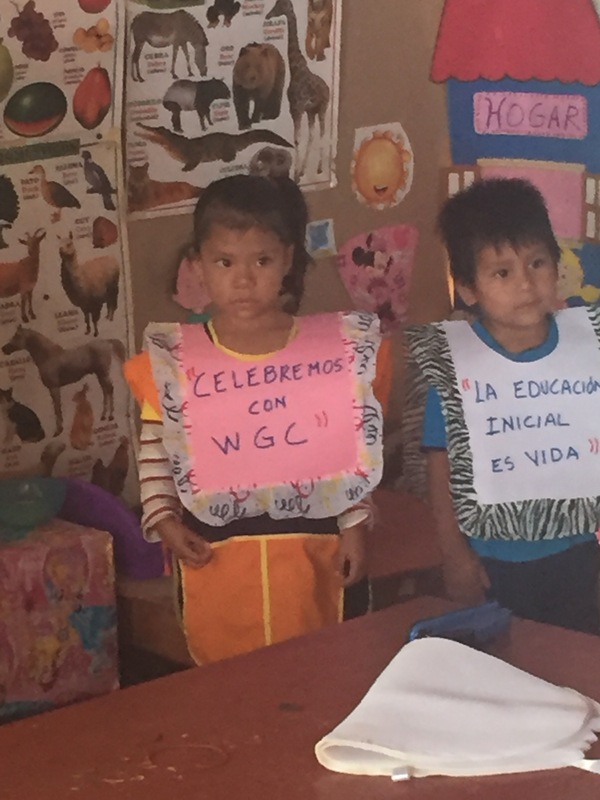 WGC has been holding professional trainings for Peru’s preschool teachers such as Edith for many years now. 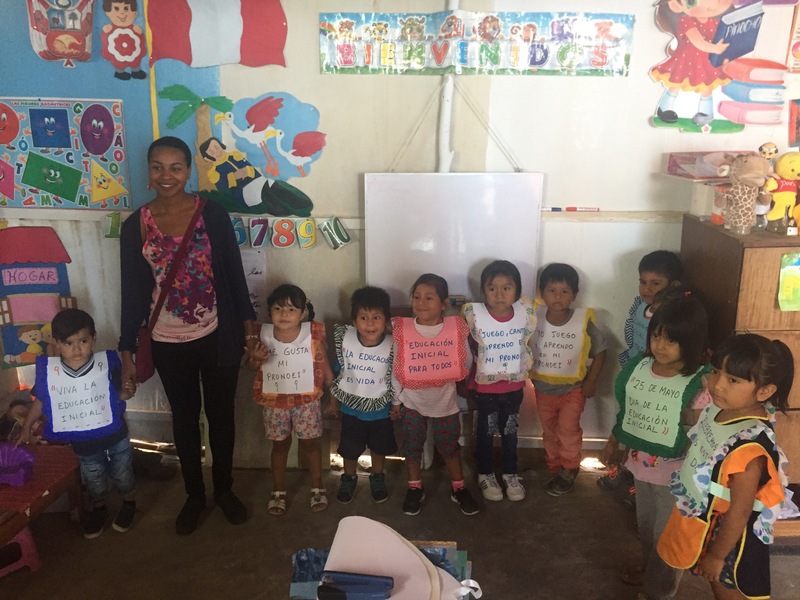 Incarnate Word Missionaries also help support the WGC early childhood education initiative while serving on the ground in Perú. 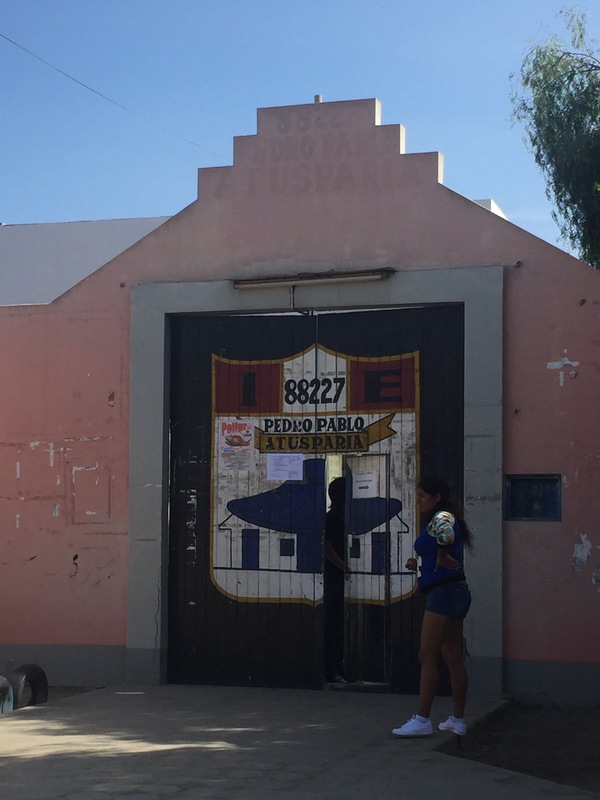 Next we visited a government secondary school where CCVI Sr. Hirayda is the principal and Incarnate Word Missionary Juan Pina, a University of the Incarnate Word graduate, serves. This school had about 1,500 kids, ranging from grades 1st-12th. The staff informed us that there are about 30 children to a classroom. The school has a long waiting list and students either go in the morning or in the afternoon. They had to split it into these short shifts because of the huge demand. Later this week, Dr. Brian McBurnett, a UIW professor traveling with our Immersion Team group, will conduct a staff training here. The ministry of education funds their school books as well as other school supplies around the campus. 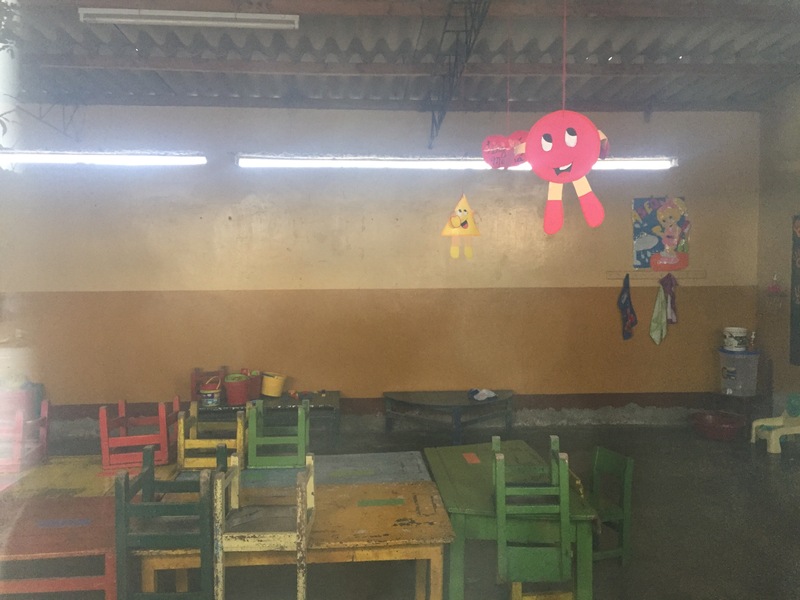 They provide milk and bread in the morning and lunch for the children to pay for themselves at a snack bar if they did not bring a packed one from home. This reminded me of the magnet school program in the United States. Besides private schools, magnet schools offer a higher education to children, but only allow a limited attendance. Everyone wants the best education for their kids, but not everyone gets one. It is a sad reality that affects both developed and developing nations alike. 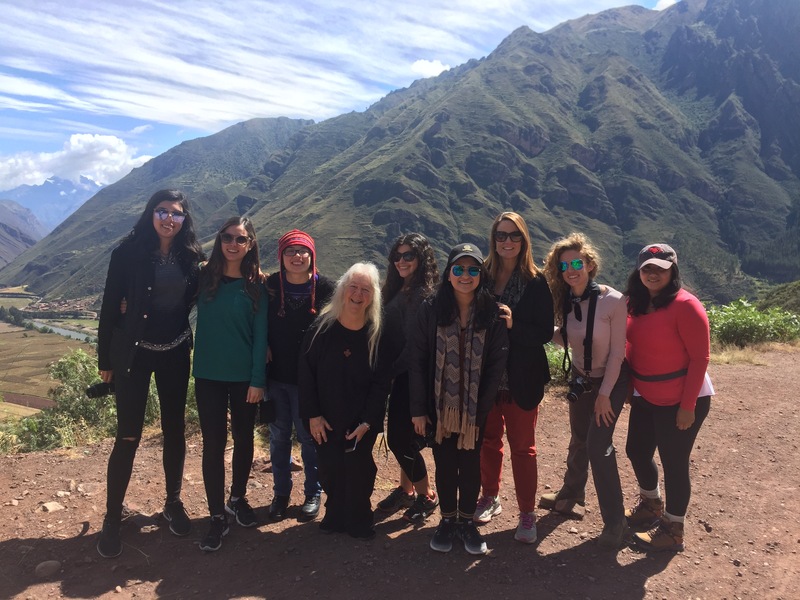 On Sunday, May 21, our group of travelers departed from Cusco to Lima to meet up with Sr. Katty and the other sisters who reside there: Mirella, Yvonne, and Carmelita. The sisters gave us a warm welcome and had dinner laid out for us in anticipation of our arrival. Going to the sisters’ was like going to a grandparent’s house; they encouraged you to have a second helping of food and then ushered you into a bedroom for a nap. There was not an empty bed in the house as the sisters made sure we were all well rested for our overnight trip to Chimbote. However, this was not before we all exchanged introductions. Sr. Katty was even able to give us a little history and background of her roots. She grew up in Lima where her parents live, but her grandparents came from the Andean highlands of the Apumac region. This she pointed out to us on a map. Her first language at home was Quechua. 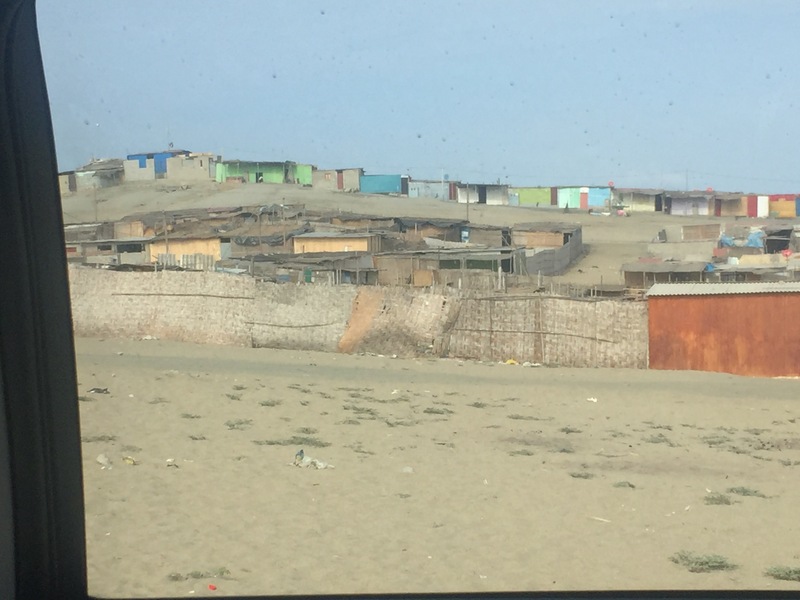 After a seven-hour bus trip, we arrived in Chimbote, the city where we are doing service for the next week. Chimbote is noisy, crowded, and not necessarily on the map for tourists. But what it does have going for it is people who are warm, friendly, and compassionate. 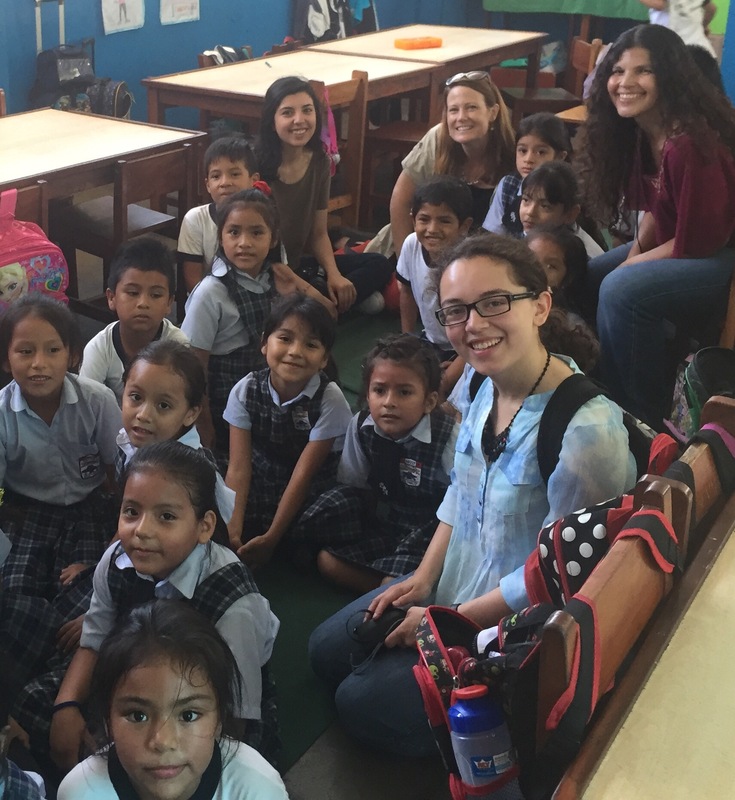 Incarnate Word sisters first began serving here over 50 years ago, and now its missionaries live and work for associated projects. 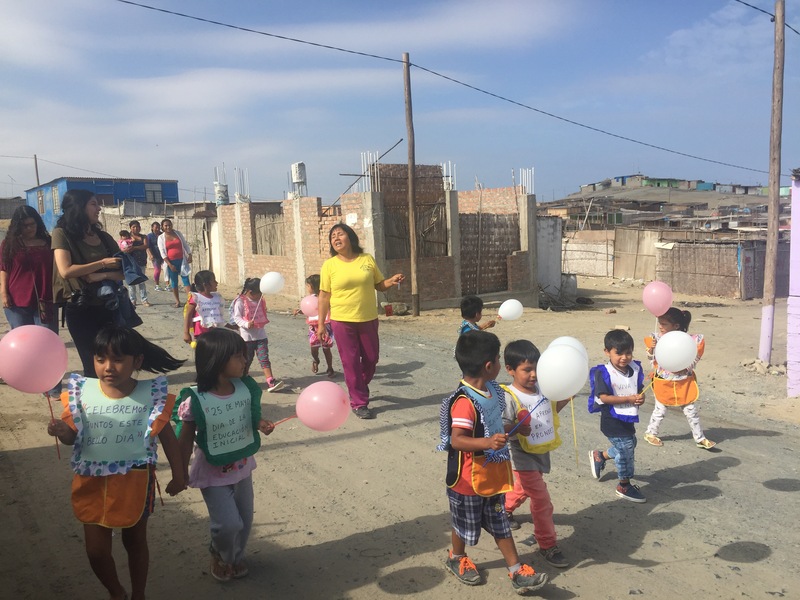 As one of the poorest and most polluted cities in Peru, the work that CCVI sisters and ministries such as WGC does here has deep meaning. After a warm exchange of “holas” and “con mucho gustos” at the front door, we all sat down in the living room and met more formally. 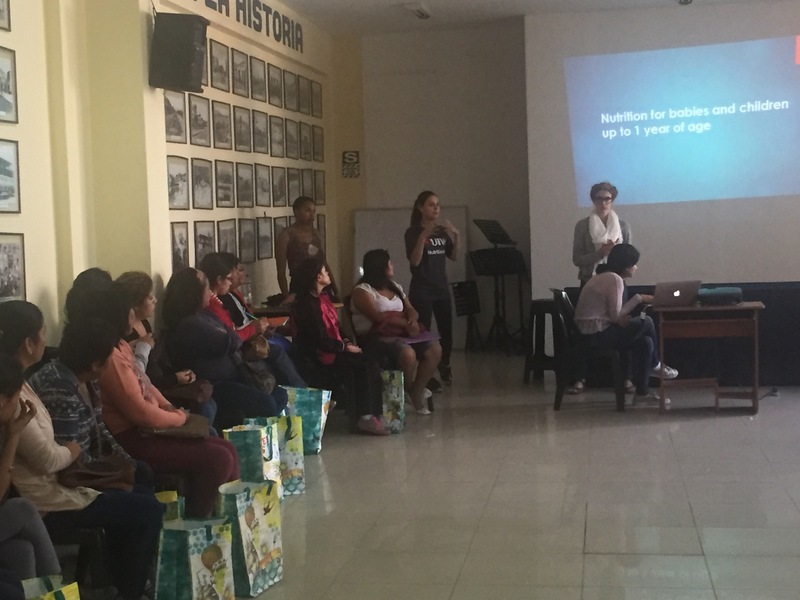 The group was able to meet and talk with four missionaries and four sisters, one of which is Sister Hirayda, an Incarnate Word sister, who has been in Peru for many decades and has spent the last two-and-a-half years as principal at a school in Nuevo Chimbote which houses approximately 1,500 students in every grade level, primary and secondary. Then it was time for the receiving ceremony, a WGC tradition, where a candle is lit and a blessing offered to compliment the sending ceremony which was done in San Antonio at the CCVI Generalate Chapel before we left on our long journey. The church adjoins the sisters’ residence, a small yellow building with a church bell. Here we learned of the three priests, Fr. Micael Tomaszek and Fr. Zbigniew Strawloski, both from Poland, and Padre Alessandro Dordi, from Italy, who were murdered in 1991 during the the Shining Path’s reign of terror in Peru. 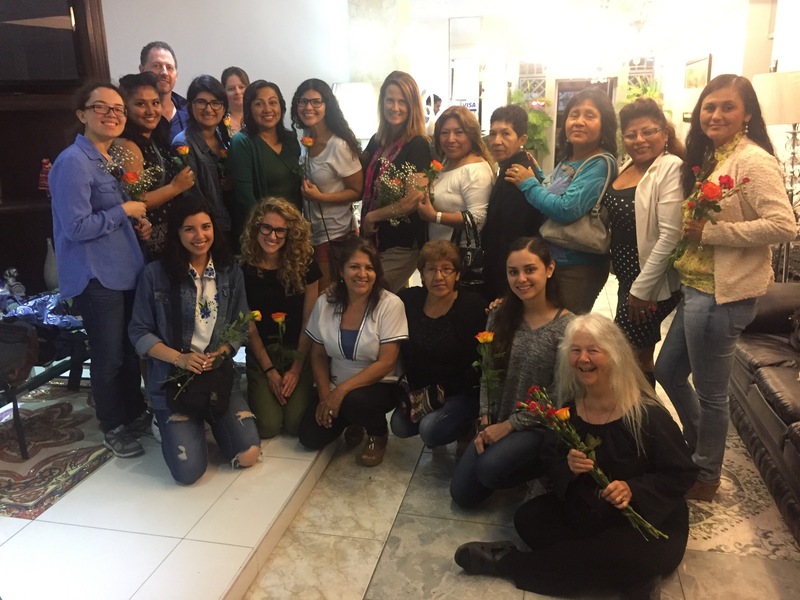 Mark Tribo – an Incarnate Word Missionary serving in Peru along with his wife, Dianne – informed the group that the priests, who worked among the poor and taught peace to the people, were beatified, which means they are in the beginning stages towards sainthood. 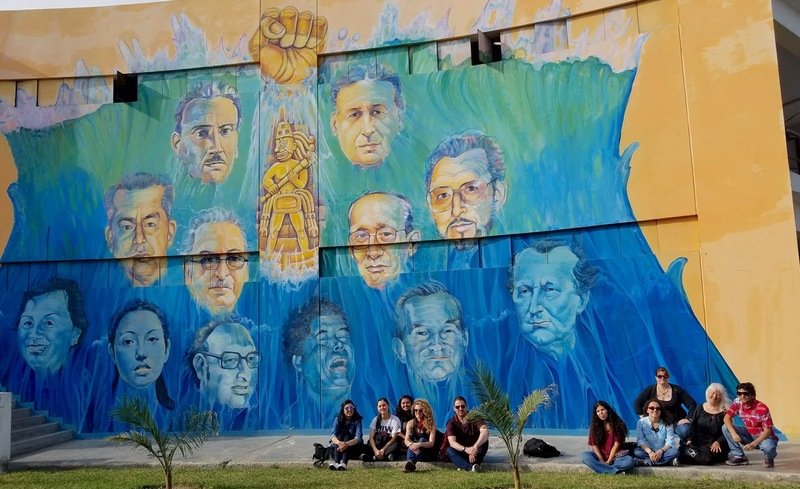 There are murals around Chimbote, which bear their likeness in honor of the three. Next on our agenda was to tour the Incarnate Word System Hospice – we had toured the system’s busy professional medical clinic earlier in the day. The hospice visit was what really touched me deeply. 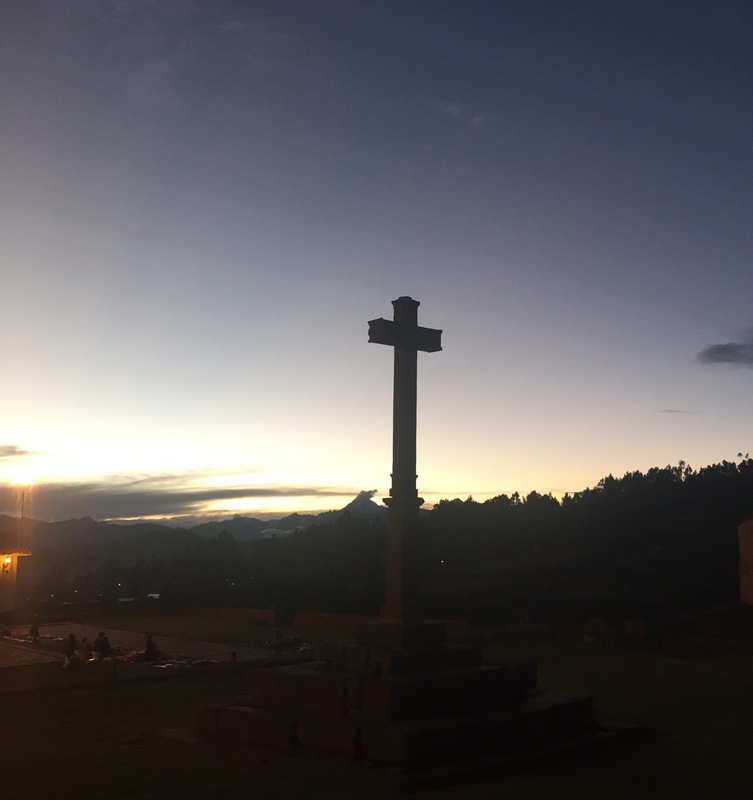 The hospice is the only one of its kind in all of Peru and quite possibly South America. Unlike a hospice in the United States where patients with terminal illnesses go to receive care up until their final days, the hospice of Chimbote accepts those who simply do not have family to care for them. The hospice currently has ten of their twenty-four rooms occupied with patients. 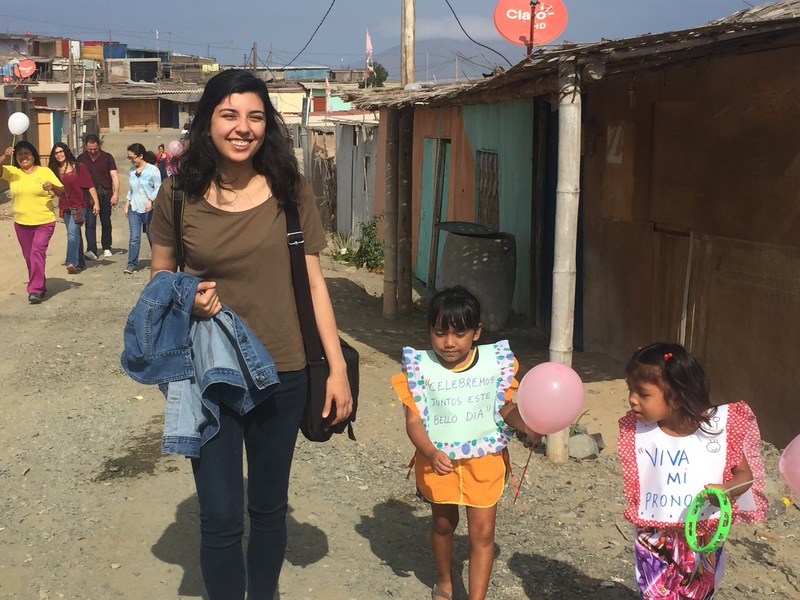 A team of ten young medical professionals from Mexico are expected to arrive in Chimbote within the week to serve the city. They will take up the remaining space. On our visit we met the kindest gentlemen, a patient who suffers from a heart condition and has no family to care for him. He was very sweet and his smile and excitement at having visitors was evident as he took photographs with us. 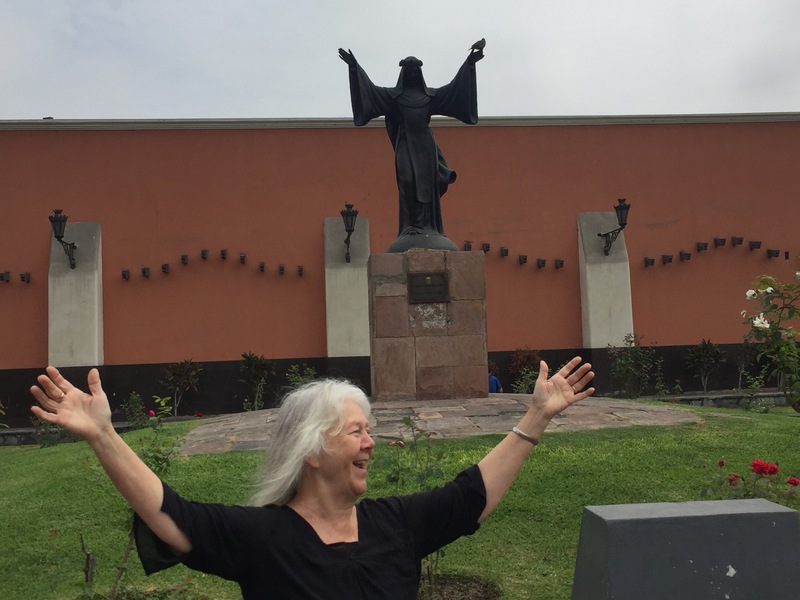 I remarked on the taxi ride back to the hotel to Selena, another Incarnate Word Missionary, that being a part of this simple exchange made me want to become a professional visitor when I grow up. I was greatly affected at the thought of him having no immediate family, yet he recognizes his family as the doctors, nurses, and rest of the staff at the hospice who offer him so much loving-care and compassion. Once we arrived back to the hotel, we were greeted by the women Pushaq Warmi, the women’s artisan collective that partners with Women’s Global Connection in San Antonio. This group of strong and lively women made me feel not so far from home – for they are fearless and independent and possess such strong personalities and great sense of humor! These are traits I see in my own female family members and the women I work with at The Ettling Center for Civic Leadership at University of the Incarnate Word. The women of Pushaq Warmi met us in the lobby of the hotel and offered us warm hugs, “besos,” and beautiful single red and yellow roses. Then our fun-loving group of travelers walked with the women to a nearby restaurant to meet up with the missionaries. 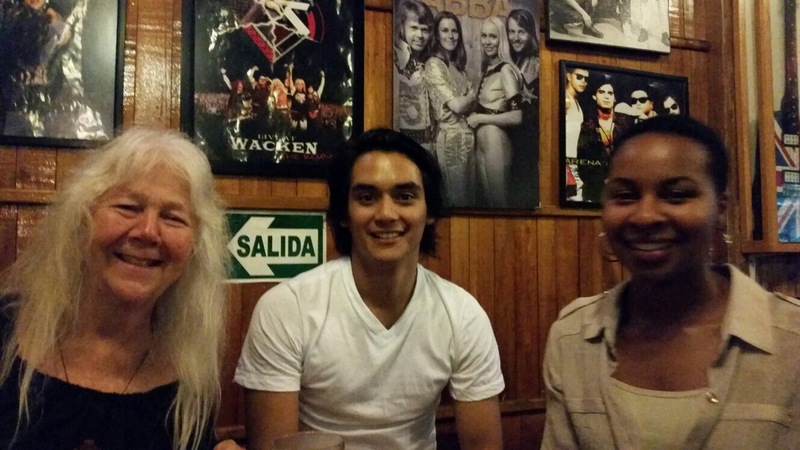 Mar & Luna Rock & Grill is like the Hard Rock Cafe of Chimbote and plays the great tunes of the 70s, 80s, and 90s. The restaurant is adorned with music memorabilia and is the local night spot for ceviche, beer, and good times. This is where we ended our first night, laughing and getting to know each other better and becoming an even bigger family of peace and changemakers who all strive to make an impact on the people who live and work and call Chimbote home. 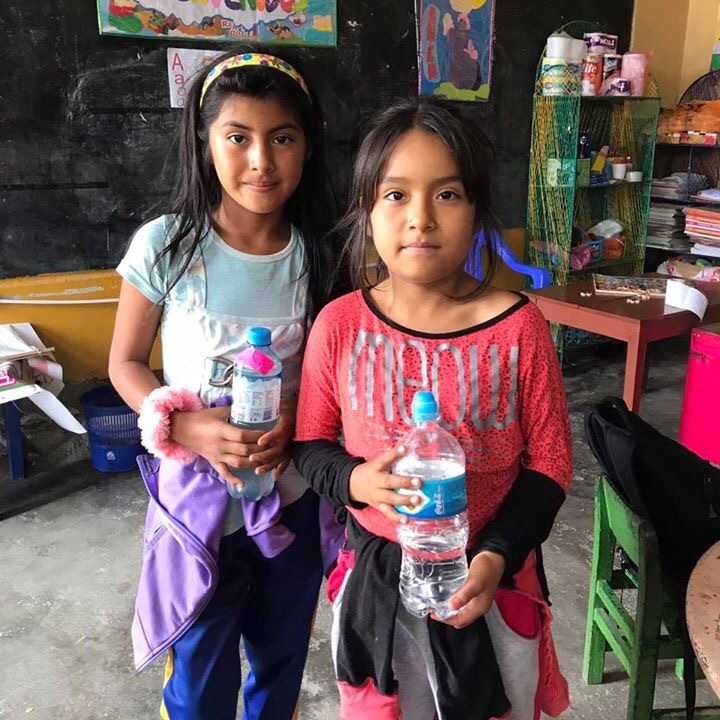 As we prepare to accompany the people of Chimbote, Peru, in various nutrition, business, educational, and art projects, we remember that the city grew so rapidly because thousands of people left the highlands of Peru thinking that they could find work in the seaside city. 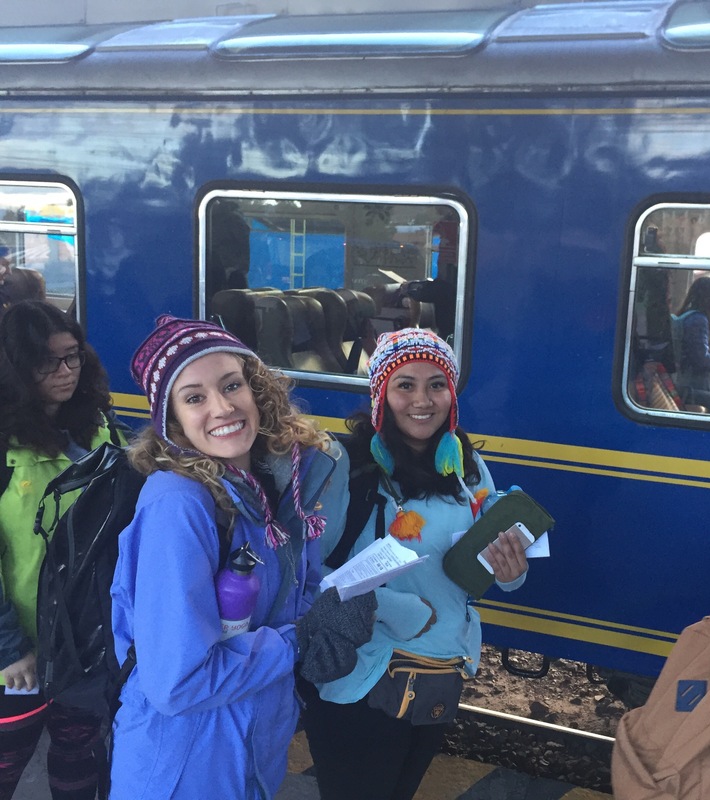 Our group is exploring what life is like in an Andean region and some of the rich history of the Incas. 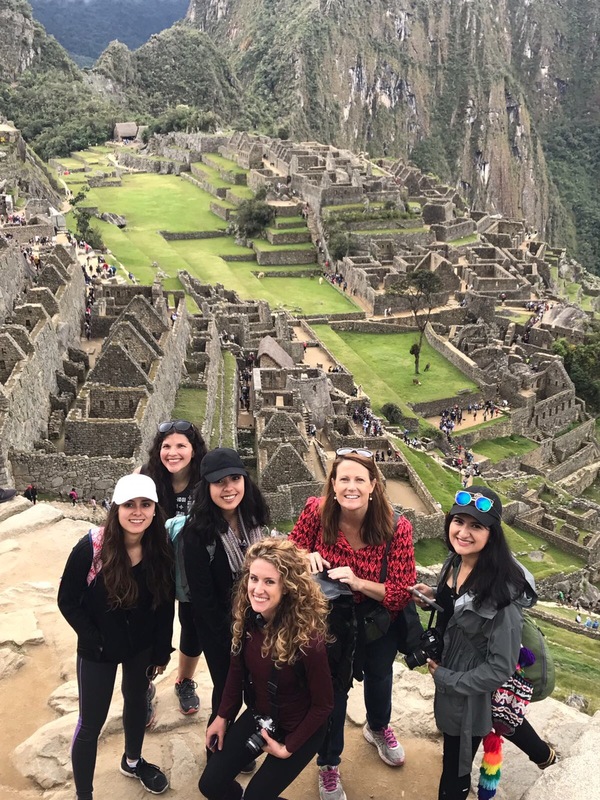 With Cuzco as our base, we have taken tours and explored many Inca sites. People 500 years ago hewed, polished, and carried stones, building these amazing temples. 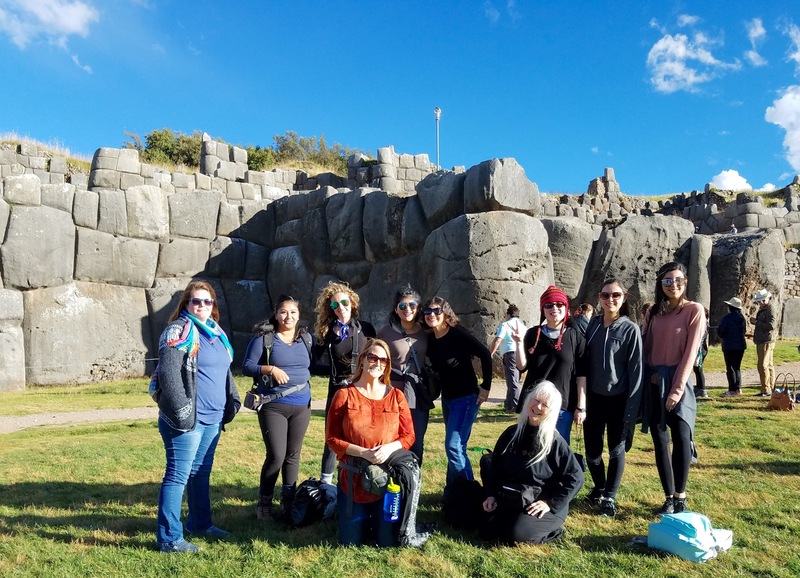 We marveled at their engineering ability moving the gigantic rocks of Saqsahuaman. 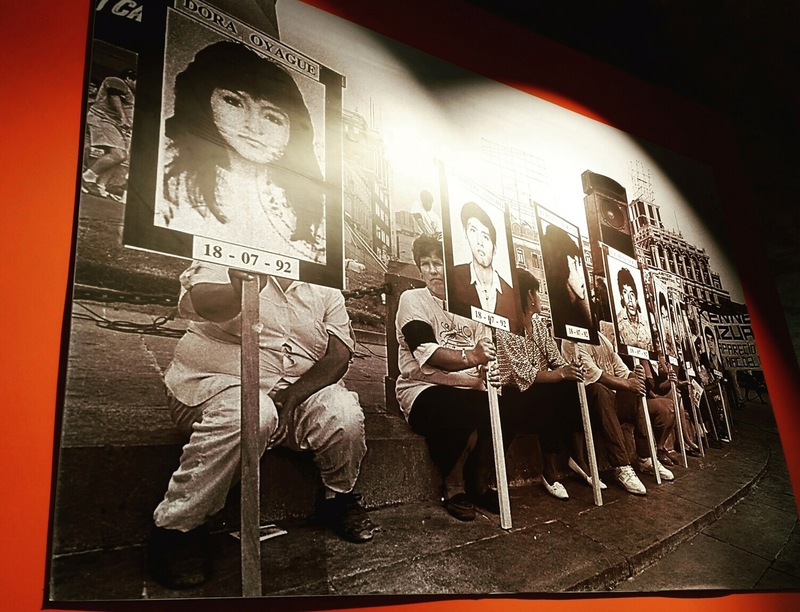 From left standing up: Elena Valenzuela, Yasmine Lainez, Stephanie Mitchell, Karissa Rangel, Monica Hernandez, Gabriela Bogran, Mariel Sanchez, Cristina Sanchez. From left lower: Nicole Foy and CCVI Sr. Martha Ann Kirk. The Pacha Mama, mother earth, is respected and revered as a source of life. An indigenous woman both sold me packages of dried corn and beans and she showed me how she was drying them. 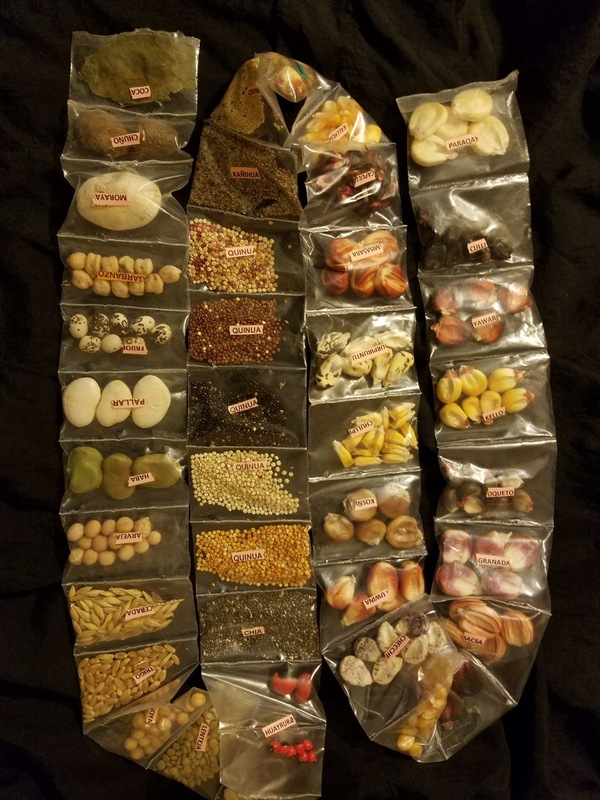 Another woman sold me a package with samples of about 40 types of seeds from familiar popcorn to completely unknown unique Peruvian seeds. Pacha Mama is generous giving an abundance of good things. Can we humans learn to share that with all? In the town of Chinchero we saw the Church of Our Lady of the Nativity which was built in 1572. 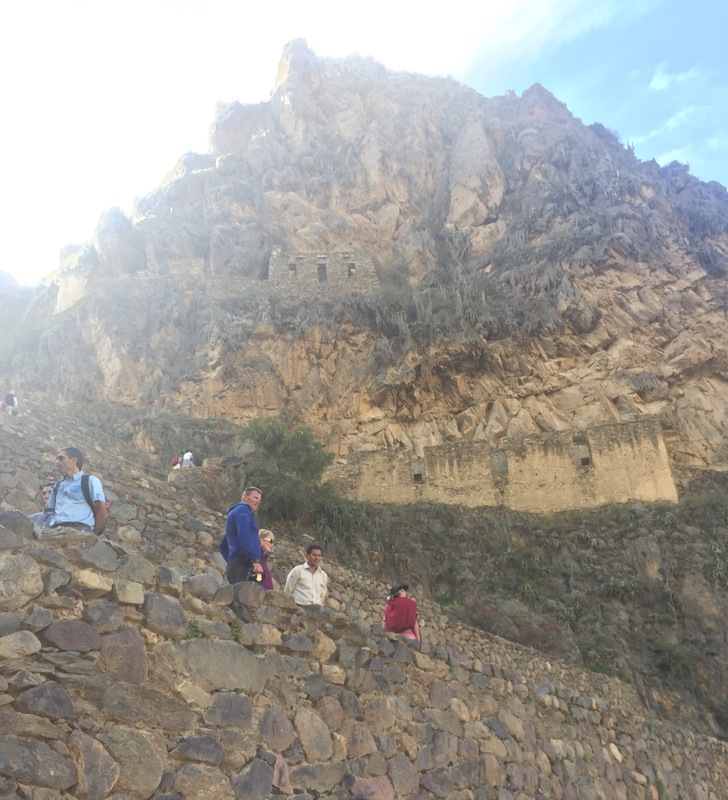 The finely crafted Incas stone could be seen on the bottom on the walls. 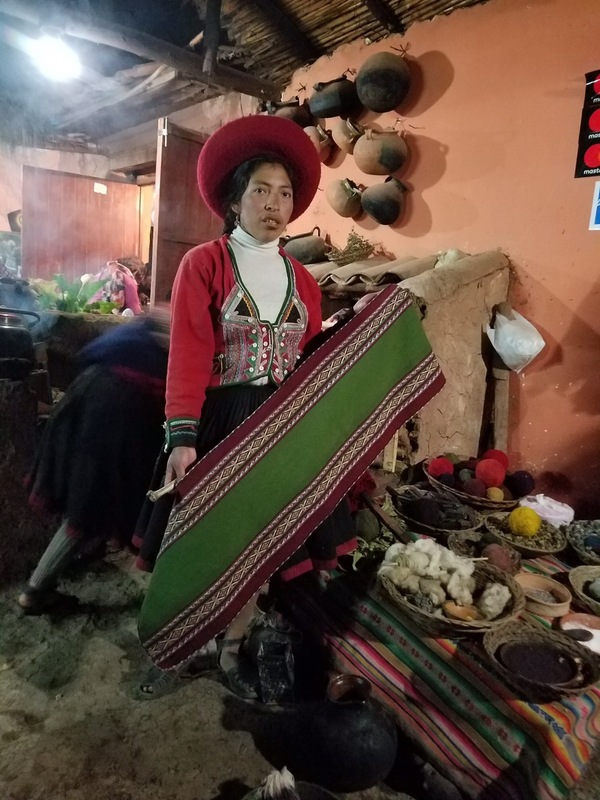 A few of our Quechua-speaking guides have had deep feelings as they describe the Spaniards and the Catholic Church taking their land and their gold and trying to suppress their culture and their language. For about 400 years until recently Quechua was not respected and people were to learn Spanish. The Spanish Conquest didn’t seem like an incident 500 years ago, but like a wound which still hasn’t healed. How fitting that in this town where some of the finest textiles in Peru are made, Mary the mother of Jesus, is depicted in a huge painting creating embroidery. Mary and her three female companions hold their fingers in a symbol for Venus and the star is depicted behind Mary. The sighting of Venus was important in the timing of agriculture in the region. Inca astrologers served here watching the movement of the stars and the planets. The painter is both acknowledging the wisdom of the Inka ancestors and showing the compassion of the mother of Christ. After seeing the church, we walked in the cold night through the village and entered a large adobe room with dirt floors and wood burning on a little stove. 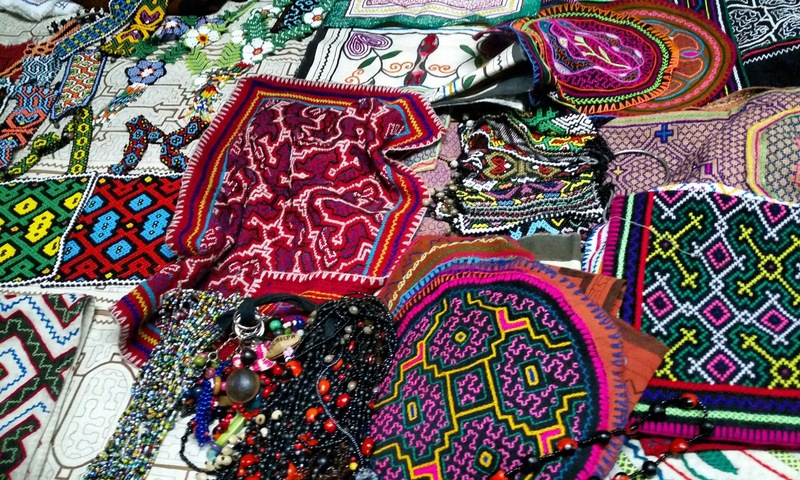 Around two sides of the room were piles and piles of vibrantly colored handmade textiles. Our hostess began to demonstrate all the stages from washing wool to dying, spinning, and weaving. Purple corn, various leaves, plants, and cochenille from the little bugs on cactus are all types of natural dye. We could imagine the grandmothers thousands of years ago developing agriculture, domesticating the animals, and developing how to make cloth. As they saw the beauty of Pacha Mamma, they wished to make clothing not only practical but beautiful. 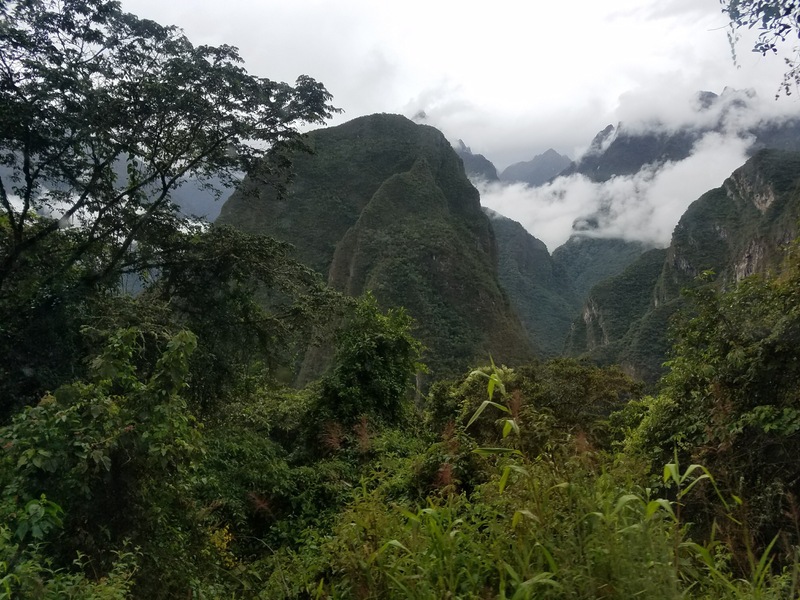 We got up before five so that we could go by bus, train, and bus again through breathtaking scenery to the World Heritage Site, Machu Picchu, the ancient Inca city that was discovered about a hundred years ago. Some of our group soared like condors to the highest place and took some spectacular pictures. In the meantime on the lower terrace Elena had quite a lengthy encounter with Lucy the llama. Yes, her ear marker said Lucy is her name! We the Incarnate Word Sisters are focusing on care of creation inspired by Pope Francis letter Laudato Si. Creation here is truly wondrous! As we have visited places of the Incas we have seen both their genius transporting water and water flowing in their temples. A gentle shower began to remind us of the preciousness of water. Remember those condors who soared? See the Soaked Condors! The shower dampened their clothing, but not their spirits. 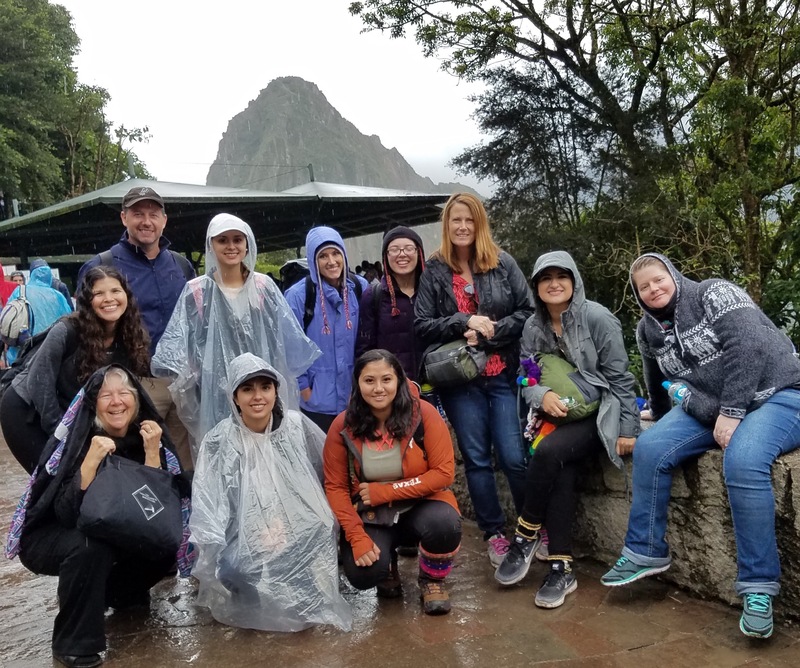 Check out our friend in the Spurs hat and note that by Machu Picchu, Dr. Brian McBurnett, UIW professor of chemistry, has joined us! Since we were in the city a few days ago, we kept remembering the crowds of workers cramped in the buses commuting long hours to work and the polluted air. Here we see the expansive sky, rushing rivers, and majestic mountains. From country to country, people search for where they can get work. Whether in the US or in Peru, when would a simple life near one’s family and land be better than the material gains of the cities? When do your children so desperately need food and education that you must do some place else? As we see examples of the brilliance of the ancient Incas, may we be firmly committed to educational opportunities for the indigenous today. May the beauty of these towering Andes and splashing rivers lead us to love creation and passionately care for God‘s earth. As we see the abundant gifts of Pacha Mamma, may we use our knowledge and skills that all may be nourished. May her beauty give us energy to joyfully encourage art and creativity in Chimbote. 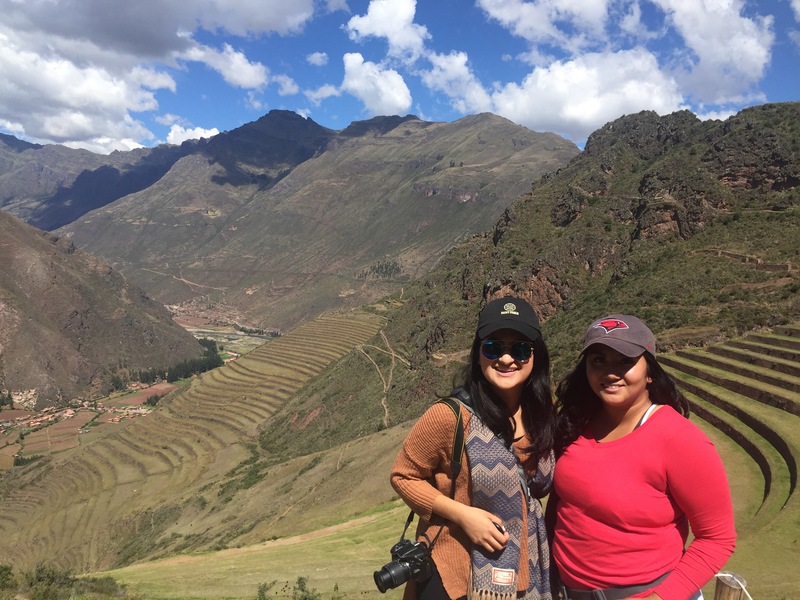 Not surprisingly, wifi access and capabilities have been incredibly challenging on our trip to Peru! 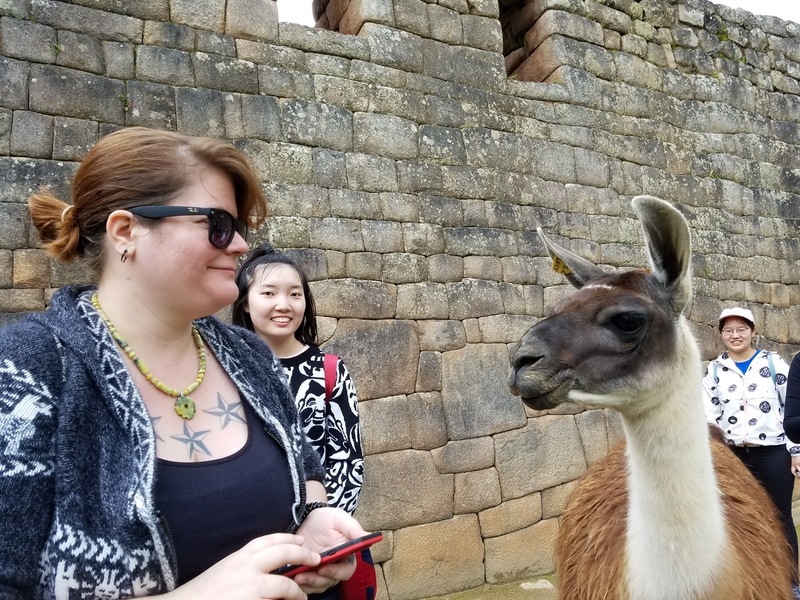 So right now we are just uploading as many pictures as possible to give everyone a taste of the exhilarating time we’ve had exploring the Sacred Valley around Cusco and Machu Picchu. 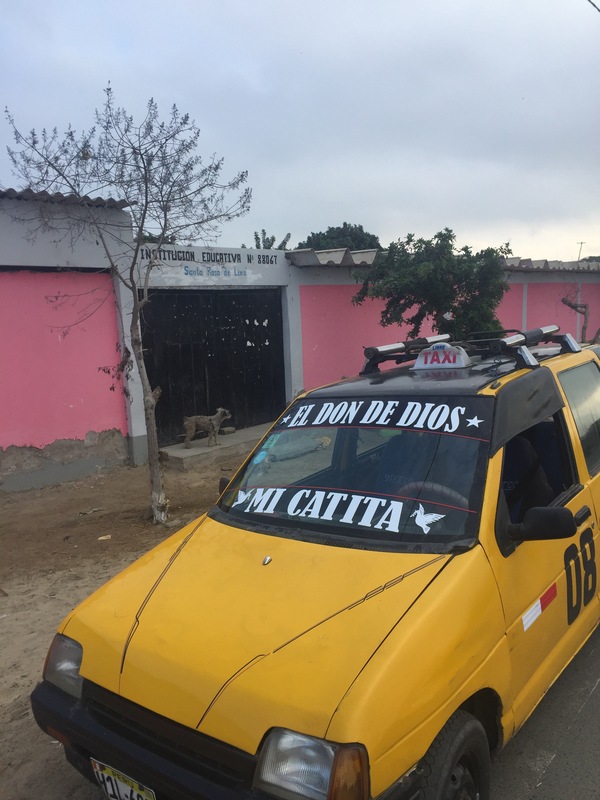 This culture and history part of our trip has created the perfect context for the upcoming service we will do in Chimbote, seven hours north of Lima. 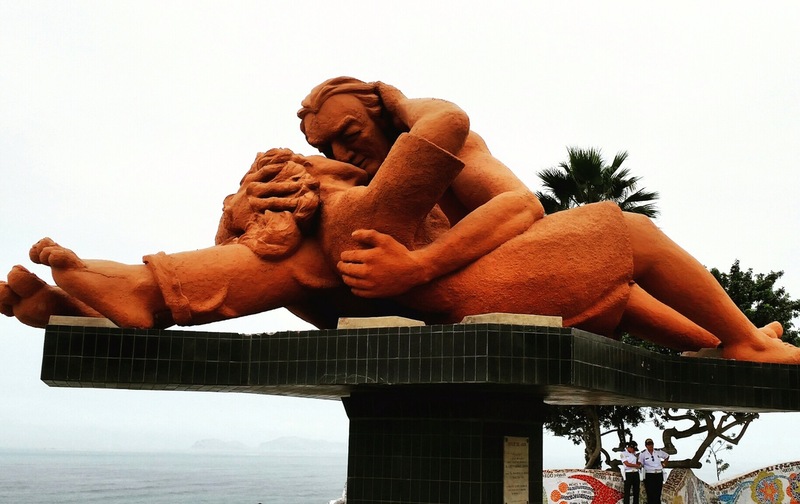 Day two of our Peru adventures began with a leisurely stroll down the bustling streets of Miraflores to take in the lovely coastal views and art of the Parque De Amor. 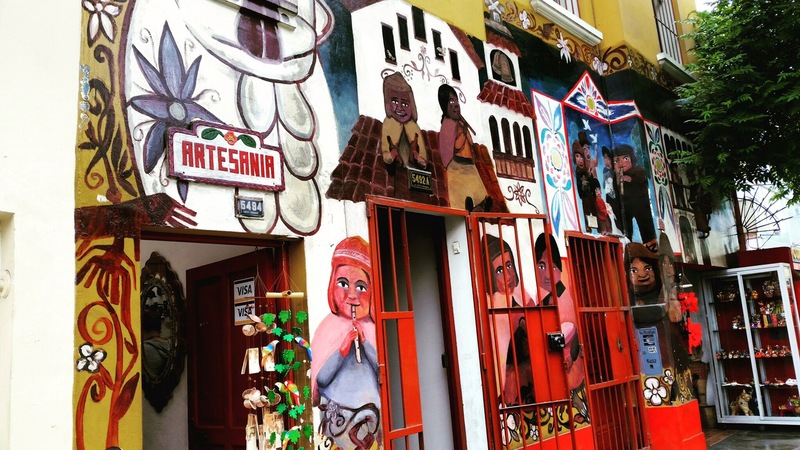 The houses and businesses in the area are as bold and vibrant as the people and culture of Peru, and a sharp contrast of colors and lush greenery greets you on every corner. As our group of young and eager travelers walked into the park, they were met with a hazy grey Pacific Ocean reminiscent of the fog of San Francisco’s bay area. Next on our agenda was walking to the nearby market plaza to do a little bit of shopping and grab some local fare for lunch. 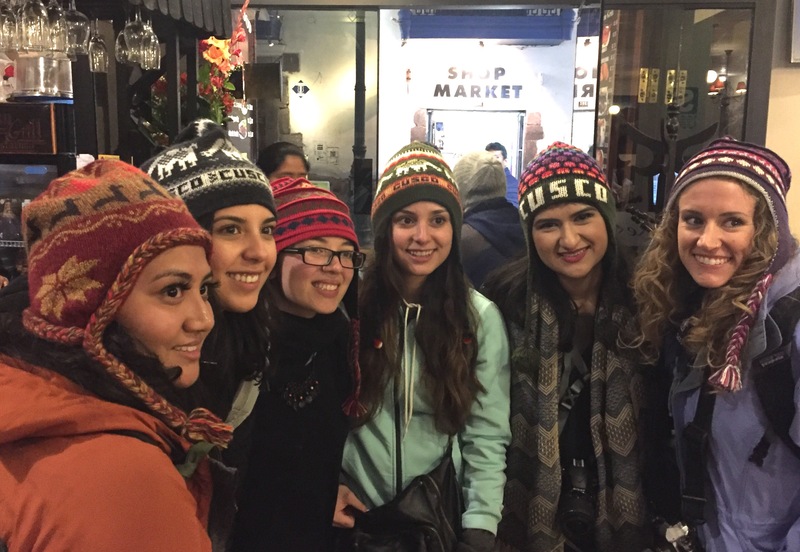 The shops were bustling with a wide array of Peruvian clothing, gifts, and wares. The shopkeepers warmly greeted you and urged you to buy from them. 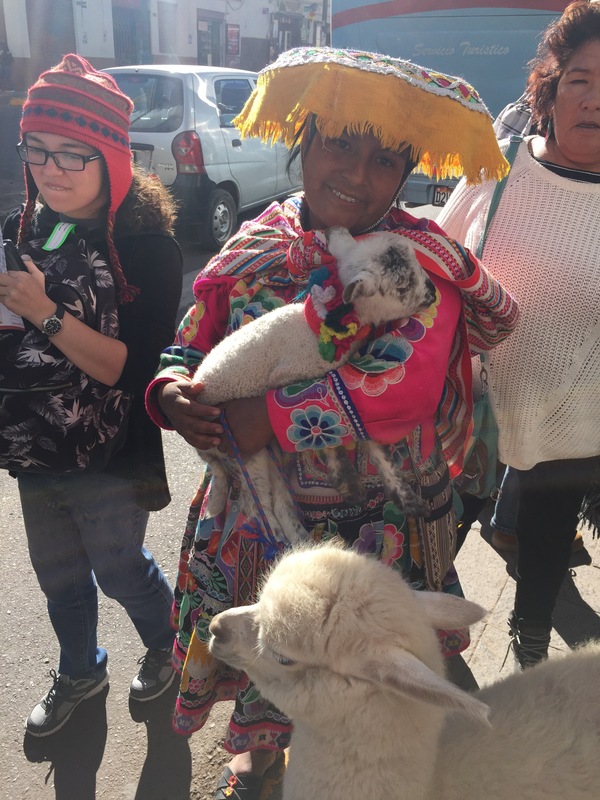 Much of the colorful textiles and clothing is traditional to Peru and made from the finest baby Alpaca and llama wool. Yet I caution travelers and tourists with an untrained eye to recognize some of the minutest details in the pieces that can reveal whether one is made of original wool or whether it is synthetic. The group separated for lunch and had time to wander off and explore the wide array of cuisines in the area. I and my friend and fellow UIW doctoral student, Elena Valenzuela, found a nice and cozy corner in a Chinese restaurant, Chifa Miraflores. Oriental food is quite popular in Lima. The food is good, the portions are huge, and the prices are reasonable. We talked about our experiences so far on the trip and our service projects to come later. She is very excited to have the opportunity to paint a mural with schoolchildren and a popular local artist in Chimbote next week. After lunch, we took a taxi, an adventure in itself, to meet up with the rest of the group at El Lugar de la Memoria, la Tolerancia y la Inclusion Social, or The Place of Memory, Tolerance and Social Inclusion. Set along the Lima coast on a hilltop, the gray minimalistic and modern architecturally designed building towers over its visitors, beckoning them to hear the many different voices and stories of the people of Peru affected during the violent and turbulent conflict between the Maoist “Shining Path” group and Peruvian armed forces in the 1980s and 90s. As is almost always the case, those most victimized and oppressed were women and the marginalized. The museum serves as a place for history to be remembered and recorded and offers to educate its guests – young and old, local and foreign. The many exhibits and installments house photos, documents, recordings, and other important pieces. Walking the floors, I took photos of the pieces that most appealed to or resonated with me while trying to translate, as best as I could, the many quotes and passages giving a story to the nearly 70,000 lives lost during this time. 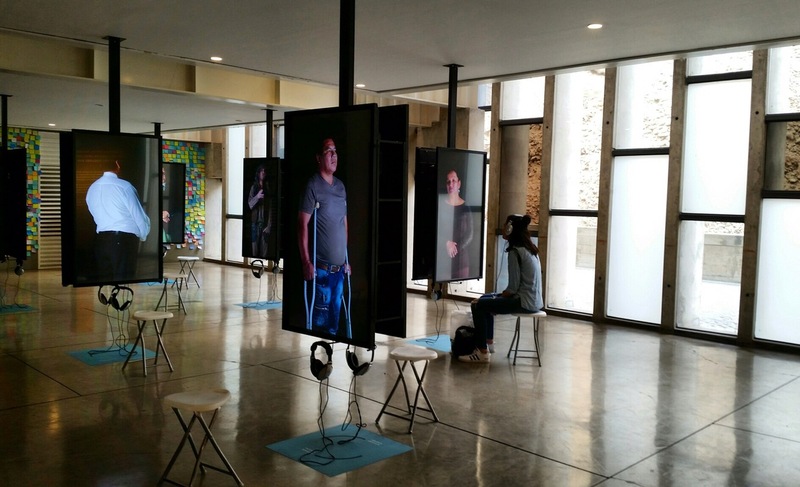 Although I could not completely decipher everything read, for it was all written in Spanish, there is a level of humanness, compassion, and shared understanding which transcends language. As with each country and culture, acts of violent history must be documented so that it serves to educate those who are born after it in the hopes of them building a more promising future filled with peace and acceptance. 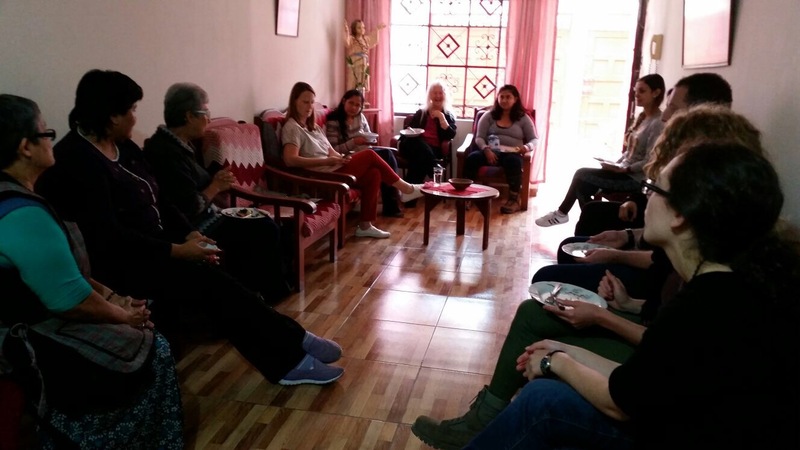 Our final outing of the day took us to the poorest section of Lima to meet up with CCVI Sr. Katty Huanuco, who introduced us to the women the Shipiba Community who live in the hills of Cantagallo, Lima. The shipomi- koniba communities are indigenous Amazonian communities who have moved to the huge capital city seeking work and education for their children. 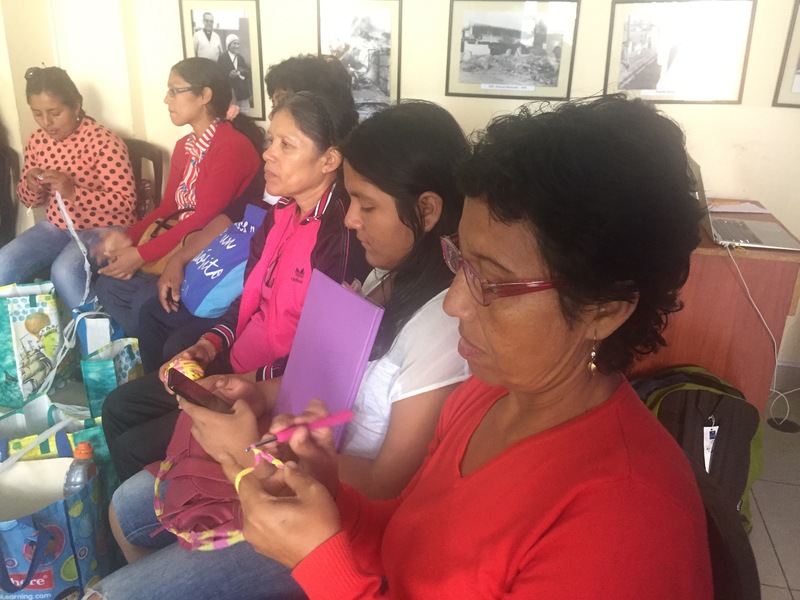 Sr. Katty, an Incarnate Word Sister, works with the women, encouraging their artisan business and strengthening their leadership skills. About a year ago, fire completely destroyed their small hillside homes. The government for the longest time refused to recognize the community’s rights to the land. 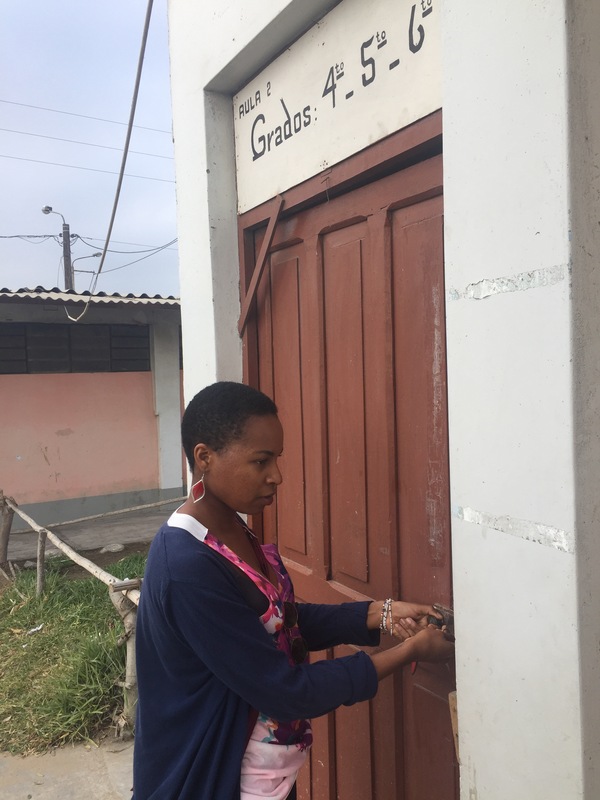 But this group of about 30 women have been leading the charge there and the government is finally relenting and allowing rebuilding. As we know, a small group of organized and impassioned women can do anything! It took our group an hour and two taxis to get to Cantagallo. 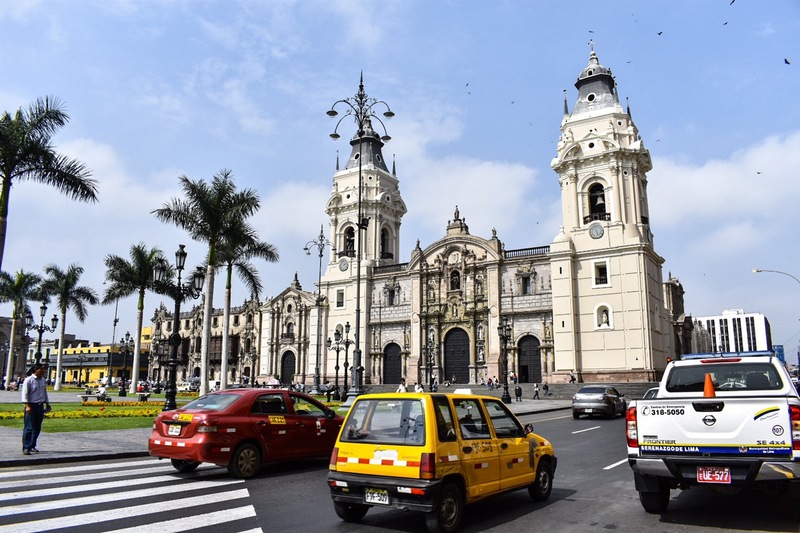 The ride gave me a glimpse of the raw side and grittiness of Lima and I could not help but focus on the many different faces of the pedestrians, as well as those who were cramped up in the many buses traveling down the tight and narrow streets at a rapid and alarming rate. It was mass chaos and allowed me my first glimpse of life in a developing country. Yet, this was the most meaningful experience for me of the trip so far for it offered me insight into the spirit and leadership of the strong and independent women that we went to visit. 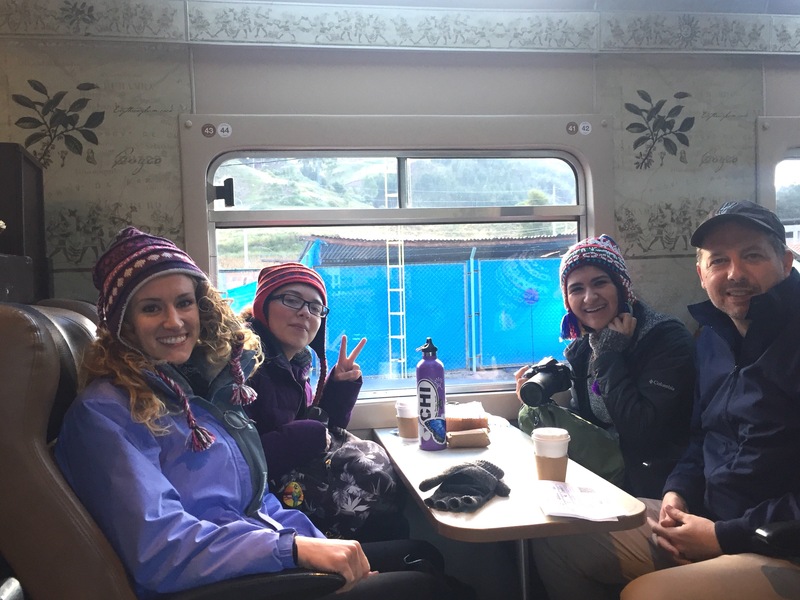 It was an honor for own group of strong and budding all-female travelers to gather in the small and welcoming home of the Shipiba Artisans’ president and leader. 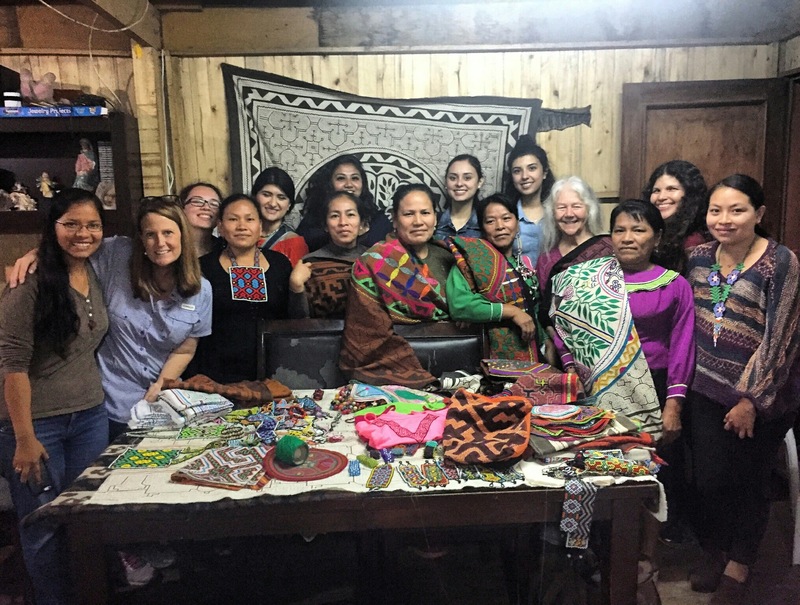 Sitting around a table, we all formally introduced ourselves to one another and then the artisans laid out their many textiles, adornments, and other pieces for us to look at and purchase. The fine detail and artistic skill that went into every piece shows the expert craftsmanship of the women. The smiles and robust character of each woman was evident and I felt a sense of community and camaraderie among us all. Once our visit was over, we went back to our taxi whose driver was kindly and patiently waiting for us. As I sat in the taxi, two curious children walked up to our car windows and smiled as they pressed their faces on the glass. They inquired whether we were going back to the United States to which one of the bilingual students in our group said, “Dos semanas.” I gave the kids a bag of candy and chips and they thanked me and went on their way. Ten minutes later we were off, but not before one of them called out to us, “Adios” and waved frantically at our taxi. I smiled and called back, waving in return. This small gesture between me and the small boy, for me, represents the warm and friendly vitality of Lima and its inhabitants. 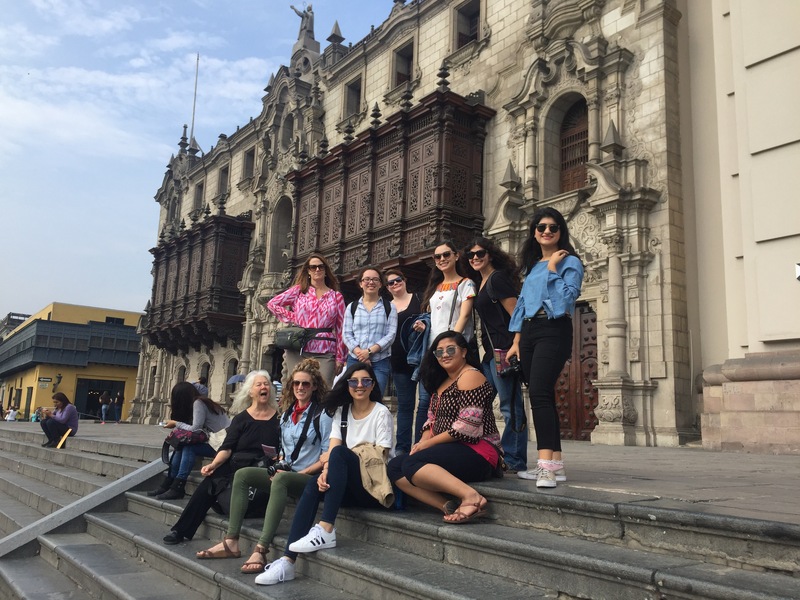 First days in Lima with 10 trooper travelers! It didn’t take long to notice that we weren’t in San Antonio anymore. 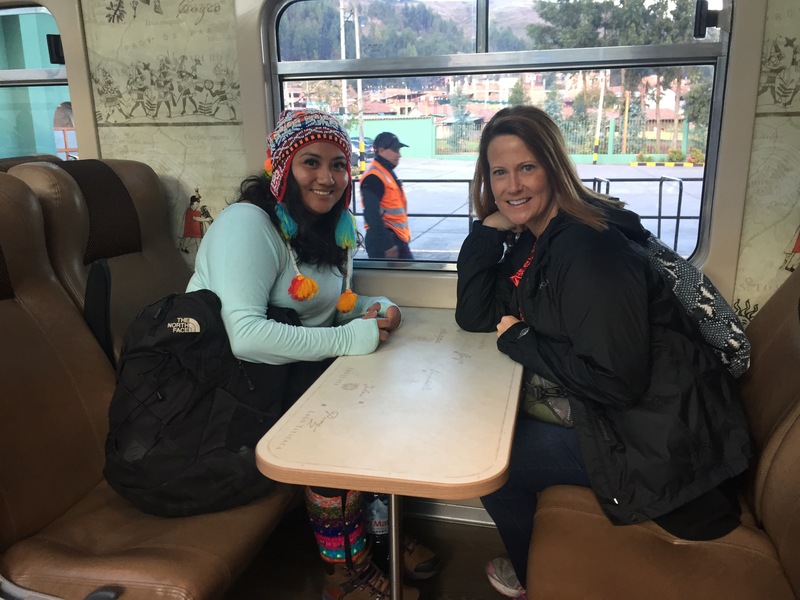 Sure the language and money changed inside Lima’s airport, but we were the same group of Texans seated tightly against each other in the bustling streets of Peru’s capital city as we made our way down the coast by nightfall to our hotel in the Miraflores area. The journey was complete and we were ready to start early the next morning, although sleepily. Our tour guide for the day, Natalie, met us bright and early in the hotel lobby with her smile and outstanding English. Boarding the van, we set off to our jam-packed day. 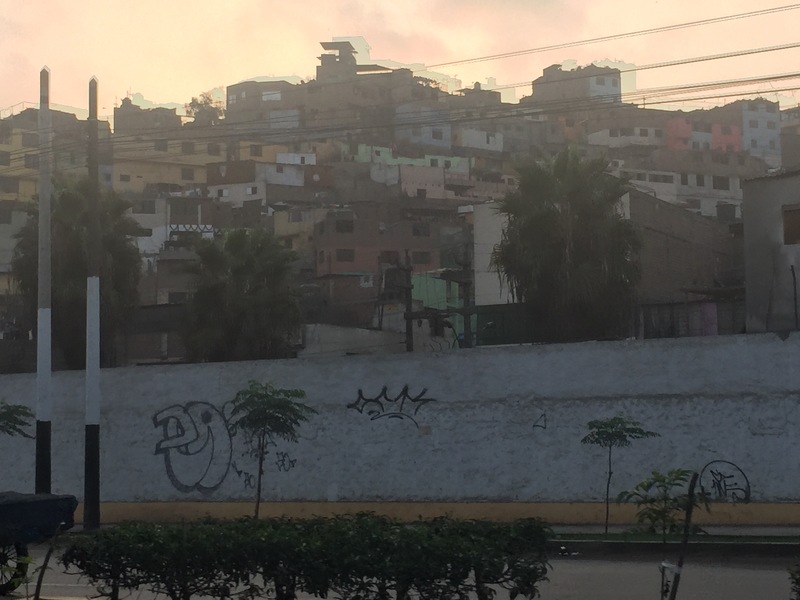 Watching as people made there way to work, the streets of Lima were more alive–and louder– than the night before. 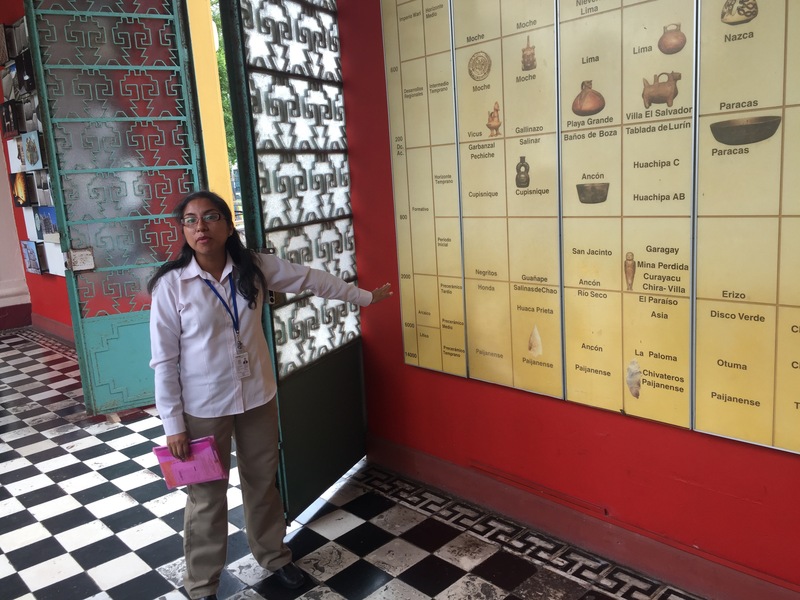 Natalie took us through the Museum of Archeology and Anthropology first to teach us the history of Peru. 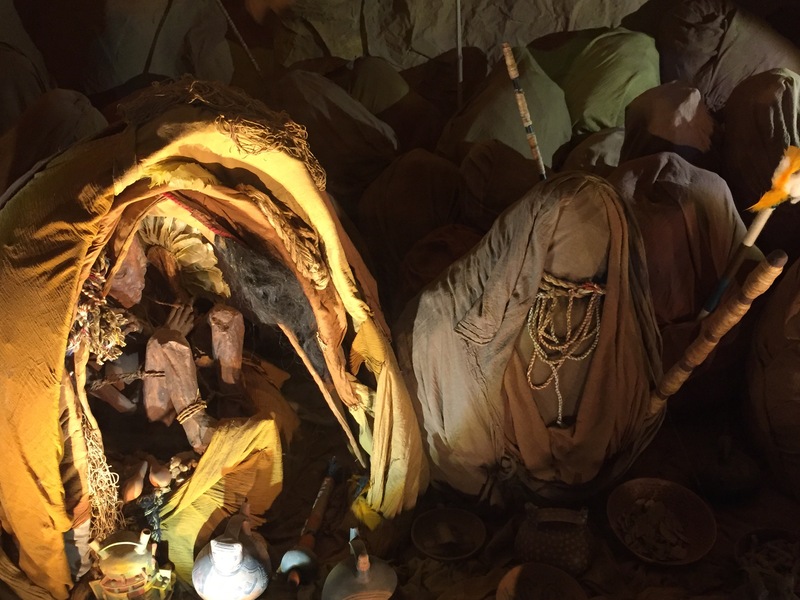 She walked us through the nomadic tribes of Peru and agriculture societies, showing us the rituals around death, “mummy bundles” in cave tombs with precious adornments and containers. She pointed out that many were placed in the fetal position because of the belief that humans could be “born again” into the afterlife. This was even before Christ. 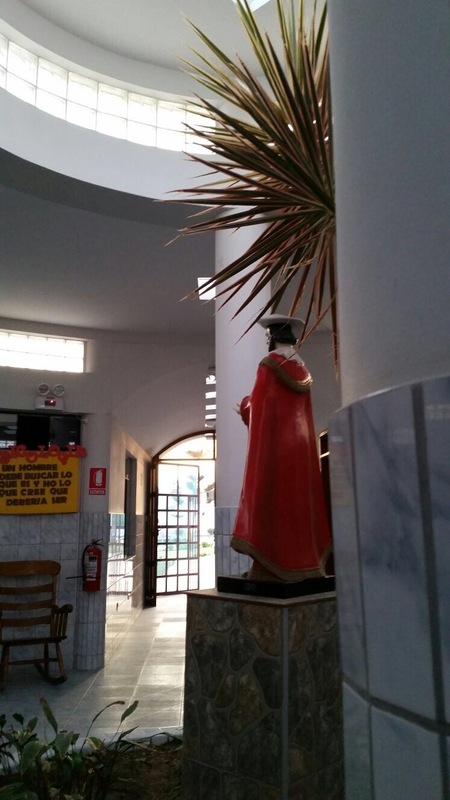 From there we visited the Santa Rosa Church, a familiar name to the group, before settling near Plaza de Armas Lima for lunch; ceviche and chicha morada para los todos. 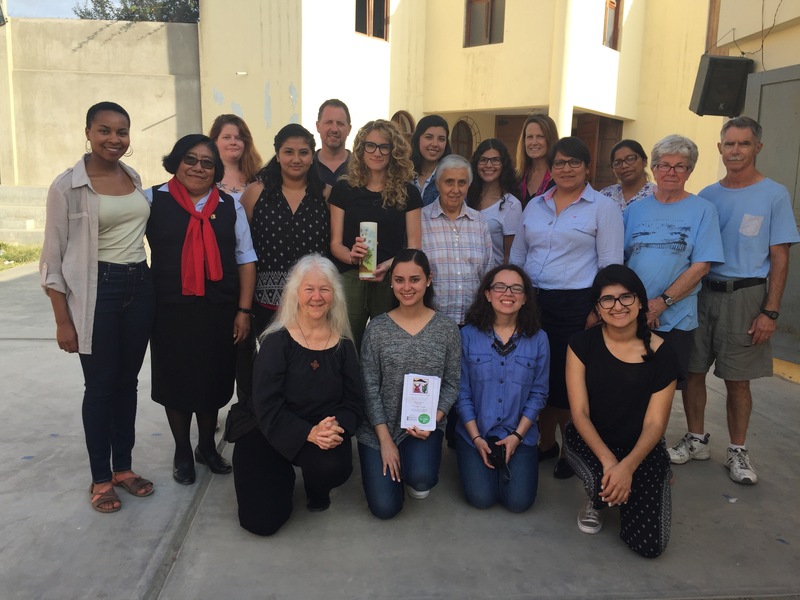 Together we traced the feminine histories of people like Teresa of Avila and Rose of Lima and noted that four times as many men than women have been named as saints in all of Catholic history. “Come on! Are men really four times holier than women? !” Said Sister Martha Ann. Ending the day with a tour of the cathedral and the Santo Domingo Monastery, we were presented with beauty left and right. God’s presence was here with us on this trip, brining us safe travels, knowledge and friends and new experiences. 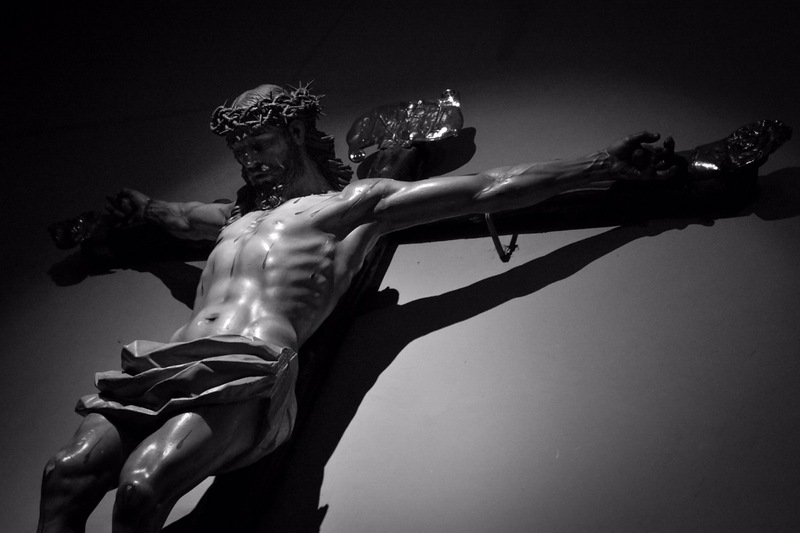 The cathedral had a larger than life crucifix with Christ on it. His pain struck me. Because of it We were all alive. Through the sacrifice of family, and even of ourselves, we were all on this trip. Through his blessing we were brought together to help women through Women’s Global Connection.